TOKYO (Reuters) – Japan issued evacuation advisories for more than a million people and canceled hundreds of flights as Typhoon Jebi sliced across the west on Tuesday, killing at least six people. Jebi – whose name means “swallow” in Korean – was briefly a super typhoon and is the latest storm to hit Japan this summer following rains, landslides, floods and record-breaking heat that killed hundreds of people. Broadcaster TBS put the number of deaths at six. Tides in some areas were the highest since a typhoon in 1961, NHK said, with flooding covering one runway at Kansai airport in Osaka, forcing closure of the airport and leaving tourists stranded. The strong winds and high tides sent a 2,591-tonne tanker crashing into a bridge connecting Kansai airport, which is built on a man-made island in a bay, to the mainland. The bridge was damaged but the tanker was empty and none of its crew was injured, the coast guard said. The storm made landfall on Shikoku, the smallest main island, around noon. It raked across the western part of the largest main island, Honshu, near the city of Kobe, several hours later, before heading out to the Sea of Japan in the evening. The center of Jebi was at sea north of Wajima in Ishikawa Prefecture, central Japan, at 7 p.m. (1000 GMT) and heading north-northeast, NHK reported. More than 700 flights were canceled, along with scores of ferries and trains, NHK said. Shinkansen bullet train services between Tokyo and Hiroshima were suspended and Universal Studios Japan, a popular amusement park near Osaka, was closed. Some 1.45 million households were without power in Osaka and its surrounding areas at 3 p.m. (0600 GMT) Toyota Motor Corp said it was cancelling the night shift at 14 plants. Jebi’s course brought it close to parts of western Japan hit by rains and flooding that killed more than 200 people in July but most of the damage appeared to be from the high winds. Her Royal Highness Princess Chulabhorn has ordered the Princess Chulabhorn College to arrange a 25-member medical team from Chulabhorn Hospital to be dispatched to Laos to provide medical treatment to flood victims on Wednesday and Thursday. The team which includes pediatricians, emergency doctors, general practitioners and tropical diseases doctors and nurses will be based at the health office of Sanamxay township in Attapeu province. About 200 Laotians receive medical treatment at the Sanamxay hospital and at an adjacent field hospital of the Lao People’s Army. Most of the patients suffer from stress and stomach diseases. On the night of July 23, a saddle dam of the Xepian-Xe Namnoy power project collapsed releasing a huge mass of water cascading downstream and swamping many villages in Sanamxay township, resulting to over 30 deaths and over 6,000 people displaced. Attapeu provincial governor Led Xaiyaporn said that he felt grateful to the Thai Royal Family and the Thai people for their assistance to the flood-affected people. Meanwhile, a temporary shelter will be handed over to about 140 families of people displaced by flooding from the dam collapse tomorrow. The shelter houses 140 accommodation units suitable for 3-4 people each was built. Each unit is equipped with an electric fan, electricity supply and a balcony to prepare food. Mr Piangkham Kiangsitthilat, a contractor for the housing project, admitted that the design of the housing unit might not correspond with the Laotians’ traditional farming lifestyle. Two more housing units of similar design are expected to be completed next month and handed over to the displaced people. The electronic banking systems of five banks – Krungthai, Kasikornthai, Siam Commercial, Bank of of Ayudhya and Thanachart – crashed today. The crash has caused disruptions in financial transactions via ATMs, mobile banking and internet banking services. 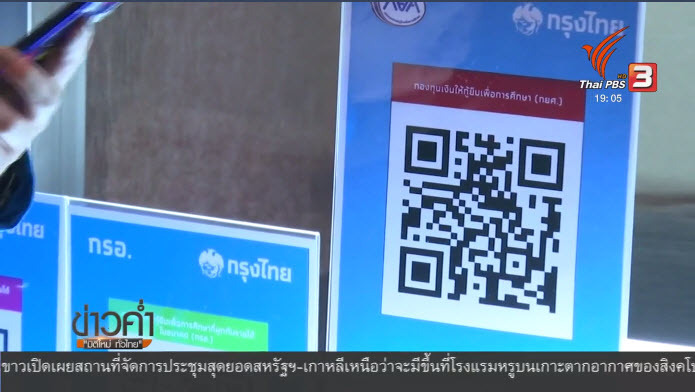 Kasikornthai informed its clients on Facebook that its electronic banking system malfunctioned and this might cause inconvenience for some financial transactions, especially with different banks. The bank said it was repairing the system to bring it back to normal as soon as possible. The electronic banking services of the five banks were expected to resume at about 10am. There were no reports of service disruptions at the Government Savings Bank, Government Housing Bank and the Bank for Agriculture and Agricultural Cooperatives. Fourteen children were injured this morning when a van carrying them on their way to school rammed into the rear of a six-wheeled truck in Wiang Pa Pao district of Chiang Rai province this morning. The van driver was also injured. Pol Lt Col Uthis Wongwai, a Mae Chedi police investigator, said the accident occurred at 7.57am on Chiang Rai-Chiang Mai rad at an intersection near Group 6 village of Tambon Mae Chedi. The van, which was fully loaded with schoolchildren of Wiang Pa Pao School, ran into the rear of a six-wheeled truck which was making a U-turn at the intersection. Fourteen children, boys and girls aged 5-10 years, and the driver were injured. They were admitted to Wiang Pa Pao hospital. Most of them were later released from the hospital. The Metropolitan Police has imposed longer periods of the ban on all kinds of trucks on five roads during the morning and everning rush hours to ease traffic congestion caused by the construction of many electric train rail tracks, Metropolitan Police deputy commissioner Pol Maj Gen Jirapat Phumichit said today. The five roads are Chaeng Wattana, Ram-Intra, Lat Phrao, Ramkhamhaeng and Sinakarin along where electric train rail tracks are being installed. Under the new truck ban, all kinds of trucks are banned from using the five roads between 5am-10am (five hours) in the morning and 3pm-9pm (six hours) in the evening. Previously, 6 to 10-wheeled trucks were banned from using these roads during 6am-9am (three hours) and 4pm-8pm (four hours), while trucks with more than 10 wheels during 6am-10am and 3pm-9pm. Trucks used for the construction of the electric train rail routes have been asked to operate on these roads at night only, Pol Maj Gen Jirapat said. The government plans to stiffen penalties for traffic violations as a means to deal with traffic gridlock in Bangkok, Deputy Prime Minister Prawit Wongsuwon said today. Gen Prawit said the traffic law will be amended to so that heavier penalties on traffic violations will be imposed. Responding to media questions on Prime Minister Prayut Chan-o-cha’s instruction for agencies concerned to find ways to solve traffic problem in the capital, Gen Prawit said officials concerned are looking forward to drafting a bill for the National Legislative Assembly (NLA) to consider. He said Section 44 of the constitution would not be used to tackle the problem, but it would instead be amendments to the Land Traffic Act to increase penalties on traffic law violators such as those who drive with driver’s licences. Work is being expedited to connect the bus, rail and boat transport systems but this does not mean it would be completed in three months as some media had reported, Gen Prawit said. The Government Housing Bank has set aside one billion baht as a fund to help its customers who are affected by flooding. GHB managing director Chatchai Sirilai said the bank had meted out six measures to help its flood-affected customers with the one billion baht fund already set aside. The assistance measures range from interest rate cuts for housing loans, new loans for customers to repair damaged houses to debt refinancing. Details of the assistance measures are as follows: zero interest rate charge for the first four months of loan instalments, interest rates of MRR-2.50 percent for the 5th to 16th instalments; interest rate of MRR-2.00 percent for the 17th to 24th instalments and interest rate of MRR-1.00 percent for the third year. New or old customers whose houses which are used as collateral for bank loans and are damaged from flooding, can take new loans from GSB which charges 3 percent interest on loans for three years. For the fourth year upward, interest rate, the interest rate will be 1 percent. Loan not exceeding one million baht is available for customers who want the money to repair their damaged houses or to build new houses. Interest rate is 3 percent for the first three years and MRR-1 percent for the rest of the term. Debtors who cannot afford to repay debts can seek compromise with the bank which will provide 4-month debt moratorium to the customers after which interest rate of 1 percent will be charged on the loans for the 5th up to the 16th loan instalments. For customers whose houses are completely damaged beyond repairs, the bank agrees to waive the remaining debt for the house and the customers are required to repay the loan for the land plots. Customers who are interested to get help from the bank are recommended to contact the bank now until December 28. Branding informal debt as an evil, Prime Minister Prayut Chan-o-cha said last night he could not afford to let unscrupulous money lenders take advantage of their poor debtors and vowed to press on with the government’s effort to solve the informal debt problem. In his weekly nation-wide address, he cited a government’s survey which showed that about 900,000 people, mostly low-income earners, are owing some 52 billion baht in informal debts to about 18,000 creditors. However, he said that since July when the government launched an all-out attempt to resolve the informal debt problem, it managed to work out compromise agreements with many creditors who agreed to restructure their informal debts with more than 200,000 debtors. For creditors who refused to cooperate with the government, he said that the centre for prevention and suppression of public frauds have resorted to legal measures against the defiant creditors, citing the achievement in reclaiming land titles deeds of over 7,000 rai of land and many cars worth altogether 3 billion baht which were seized from the debtors by their creditors. For farmers who are indebted to the Fund for the Rehabilitation and Development of Farmers, the prime minister said the ad hoc panel tasked with solving the debt problem managed to negotiate with the Bank of Agriculture and Agricultural Cooperatives and other creditor banks to restructure the debts of 36,000 farmers totaling 6 billion baht. He hailed as an outstanding achievement in 19 years since the launch of the Fund that the ad hoc panel had succeeded in cutting down the total debts by half to 3 billion baht and in suspending interest payments for debts which are not more than 15 years. The North and Northeast regions will continue to be hit with widespread rain and isolated torrential downpours during Aug 16-17 as tropical storm “Bebinca” is expected to move to upper Vietnam and Laos during that period, the Meteorological Department said in its weather forecast this morning. As of 4am today, the storm was almost stationary over the South China Asea with maximum sustained winds of about 65 kilometres an hour. Flash floods are possible in risk areas in the North and Northeast. People are advised to beware of a severe weather condition. In the South, the strong southwest monsoon is still prevailing over the region. Wind waves are expected to be 2-4 metres high in the Andaman Sea and 2-3 metres high in the upper Gulf of Thailand. All vessels should proceed with caution and small boats should keep ashore. People living also the western and eastern coasts should beware of strong winds. This handout photo released by NASA shows the United Launch Alliance Delta IV Heavy rocket with the Parker Solar Probe on board launching from the Mobile Service Tower on August 12, 2018, Launch Complex 37 at Cape Canaveral Air Force Station in Florida. NASA postponed until August 12, 2018, the launch of the first ever spacecraft to fly directly toward the Sun on a mission to plunge into our star’s sizzling atmosphere and unlock its mysteries. The reason for the delay was not immediately clear, but was called for after a gaseous helium alarm was sounded in the last moments before liftoff, officials said. People in Phetchaburi province, especially in Muang district, have been warned that they might have to endure flooding for up to 1-2 months. National Water Resources Office secretary-general Somkiart Prachamwong said Saturday that the Kaeng Krachan dam was expected to be filled up to its full capacity in the next 10 hours and then the excess water would spill over the spillways estimated at about 300 cubic metre/second and flow into Phetchaburi dam before it would hit Muang district at about noon on Monday. The overflow from the dam will push up the water in the Phetchaburi river in the Muang district to a level about 50 centimetres higher than the level recorded in 2016. Mr Somkiart predicted that Muang district would be affected by flooding as it was last year, but the flooding situation might prevail up to 1-2 months. But he said the Royal Irrigation Department and relevant agencies were prepared to step up efforts to drain as much water as possible into the sea. Besides Muang district, Ban Laem, Tha Lat and Tha Yang districts are expected to be affected from the increased drainage of water. Relief and rescue equipment sent by the Public Disaster Prevention and Mitigation Department will be arriving at the command centre at the Phetchaburi provincial hall on Sunday. An irrigation official said that as of Friday until Saturday morning, water in Kaeng Kracnah dam is steadily increasing by one centimeter per hour, making it necessary for more water pumps to be installed to increase water drainage. Meanwhile, the Meteorological Department predicted more rains in the western and northeastern regions today until Wednesday bringing more water into Srinakharind, Kaeng Krachan, Vajiralongkorn and Pran Buri dams. Prime Minister Prayut Chan-o-cha thanks the United State government for the return of 12 pre-historic artefacts of the Ban Chiang era to Thailand and all parties concerned for their hard work which made the recall bid a success, government spokesman Lt Gen Sansern Kaewkamnerd said on Saturday. Lt Gen Sansern said Gen Prayut is full of praise for the Culture Ministry, the Foreign Ministry and other agencies for their role in bringing back the Ban Chiang artefacts to Thailand. The aretefacts were previously in the possession of an American woman. The prime minister also thanked the US government for its understanding and providing convenience for the return of the artefacts, particularly the US ambassador to Thailand. “The prime minister has stressed that the return of artefacts on this occasion should be recorded as an important historical event for further dissemination to the people, especially children and youth. The artefacts should be put on display for the Thai people to see so they can be proud of the value of Thai cultural heritages,” Lt Gen Sansern said. The spokesman said the prime minister also conveys his moral support for officials who are working hard for the return of other artefacts including the lintel of Nong Hong temple ruin in Buri Ram province, the lintel of Khao Lon temple ruin in Sa Kaew province and many other ancient objects which are being displayed at US museums. The highways office in Phetchabun province has ordered the closure of the road leading to Phu Tub Berk mountainous resort village for major repairs after more cracks from landslides were found on the road, making it unsafe for motorists. Workers with heavy machines on Sunday filled up cracks at four points of the road, Highway 2331, in Ban Doi Nam Piangdin, Tambon Ban Nern of Lok Kao district and opened the road to traffic. However, more serious cracks were later found, forcing the highways office to close the road again on Monday for major repairs. Director of the Phetchabun highways office, Mr Alongkorn Promsilp, who inspected the road with his engineers, said that for public safety it was necessary for the road to be closed again temporarily until the cracks were repaired and that the road was proven to be safe. He suggested motorists who wanted to visit the famous mountainous resort village in Phu Tub Berk and farmers who wanted to bring their farm products to the market to use an alternative route on Highway 12 at the junction of Ban Yaeng in Nakhon Thai district of Phitsanuloke. Mr Wanchai Chayarom, village head of Village 16, Ban Tub Berk, who is also chairman of Phu Tub Berk tourism group, said he was afraid that the repairs would take a long time because landslides continued to occur periodically. He suggested construction to be resumed on the other 15-km route to Phu Tub Berk which was suspended due to suspected corruption, saying that the road was almost completed with the remaining two kilometres which are still covered with laterite. 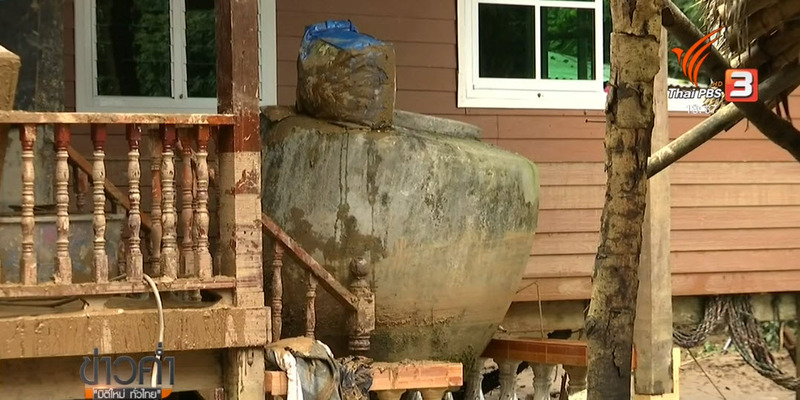 Many residents of Ban Sanaepong village in Sangkhla Buri district of Kanchanaburi province have returned to their homes today after flooding has receded but they have found to their dismay that their houses are covered with mud if not badly damaged. Mr Somchai Wutthipimonwitthaya, mayor of Laiwo tambon administration organization (TAO), said that, initially, he thought the situation in Ban Sanaepong would return to normal after flood water receded. But he was wrong after an inspection of the village, he admitted, adding that it would require a big cleanup to remove mud and other debris from many houses and roads in the village before the residents could settle in their houses. The only thing that the Laiwo TAO officials could do for the time being was to repair the only road linking the village with the outside world so that it could be used again. All the 200 families in the village with the exception of men were evacuated to a temporary shelter at the Laiwo TAB office for their safety three days ago when flash flood caused by heavy rains struck the village three days ago. One of the residents, Mr Wisanu Sangchalatharn, who owned a grocery shop before the flooding, was shocked when he found out that his shop was no more with all the goods stored on shelves being washed away or covered thickly in mud. It was the same for Mr Preecha Po-ngern’s house. He told Thai PBS news team that he didn’t know what to do besides cleaning up his house which, he said, would be carried gradually carried out. House repairs must wait until there is a big clean-up to remove all the mud and debris from houses and public places. However, rains continue to pose an obstacle to rehabilitation effort. The commander-in-chief of the Royal Thai Navy, Admiral Naris Prathumsuwan, has praised the bravery and dedication of the Thai Navy SEALs and naval medical staff for their performance in the rescue operation to help the 12 Wild Boars footballers and their coach out of the Tham Luang cave and in the search and rescue of the victims from the sunken Phoenix boat in the rough sea off Phuket earlier this month. He also singled out Rear Admiral Arpakorn Yookongkaew, commander of the Thai Navy SEAL, and Special Captain Anan Surawan, commander of the First Special Warfare Corps of the Naval Special Warfare Command for special praises. Members of both units played a crucial role in the Tham Luang rescue mission. In a citation formally issued on July 13 and posted on the Thai Navy SEAL webpage yesterday. It said that altogether 127 SEAL members and 32-member medical team took part in the hazardous rescue operation to extract the 13 survivors out of the flooded cave. Navy divers and personnel also spearheaded the mission to search and rescue Chinese tourists after their diving boat, the Phoenix, sank off Phuket. Petty officer Samarn Kunan who died during the rescue operation was praised for his bravery and sacrifice. His rank was posthumously promoted to that of lieutenant commander. No-swimming signs were put up on Nai Han beach in Phuket today after a crocodile estimated to be about two metres long was sighted swimming in the sea about 100 metres from the shoreline on Wednesday. Tambon Rawai mayor Aroon Soros said there are fears that the crocodile, which is believed to have escaped out of a crocodile farm on the island, is still in the sea off Nai Han beach near a rock formation toward Laem Krathing. Crocodile watch teams have been set up to look out for the reptile whereas tourists were warned not to swim in the area until the crocodile is captured. Mr Chatuphorn Burutpat, director-general of National Parks, Wildlife and Plant Conservation, said that officials from marine and coastal resources office in Phuket had been ordered to observe the situation on Nai Han beach. He admitted that he didn’t know the species of the crocodile. Earlier last year, a hybrid crocodile named Le Pung was spotted swimming in the sea off Bang Thao beach before it was captured and sent to a private zoo in Phuket. Parts of the aircraft scattered all over the crash site which has been cordoned off for further examination, he said. Of the three people killed, only two were identified. They were Wanchai Waratisai, a pilot of SFS Aviation Company, and Seksan Wanna, 51, of Phetchabun’s Muang district. Atthaya Larpmak, director of the Khon Kaen airport, said initial reports reaching him said the helicopter, an Airbus helicopter AS355 NP, belonging to Hililux Aviation Company, departed from a flight training airfield in Saraburi. The aircraft lost contact while flying over Chonnabot district of Khon Kaen in the cloudy sky. Authorities concerned were investigating the cause of the accident, he said. Teachers who have threatened to stop servicing their debts to the Government Savings Bank were warned that they could face serious consequences, including the prospect of being declared bankrupt by the court. Deputy justice permanent secretary Thawatchai Thaikhieu on Tuesday posted his opinion on his Facebook page in response to an online video clip featuring about 100 teachers gathering to make a declaration demanding the government and the GSB to provide about 450,000 teachers who took loans from the GSB under the funeral welfare fund scheme six-month debt moratorium starting October 1. They also threatened to stop repaying their debts to the GSB starting August 1. Mr Thawatchai said that teachers who refuse to honor their debt repayment commitment could face the prospect of facing bankruptcy lawsuits if the amount of their debts is beyond one million baht. Worse still, he said their guarantors would be in trouble as well as they might also be slapped with bankruptcy lawsuits if they could not come up with debt repayments on behalf of the debtors. Mr Thawatchai also warned that if any teachers were declared bankrupt by the court, they could lose their teaching jobs because, according to the law, a bankrupt person is not qualified to become a teacher. He further clarified that a person declared bankrupt by the court will have his/her freedom of movements and right to undertake legal transactions restricted. For instances, they cannot perform any legal and financial transactions; are banned from travelling abroad unless there is a permission from officials of the legal execution department. A British diver involved in the rescue of a Thai soccer team from the flooded Tham Luang cave system has dismissed Tesla CEO Elon Musk’s proposed mini-submarine as a PR stunt. Vern Unsworth, 63, who played a key role in helping the young footballers safely out of the cave, rejected Musk’s idea to use the mini-submarine for the rescue mission. 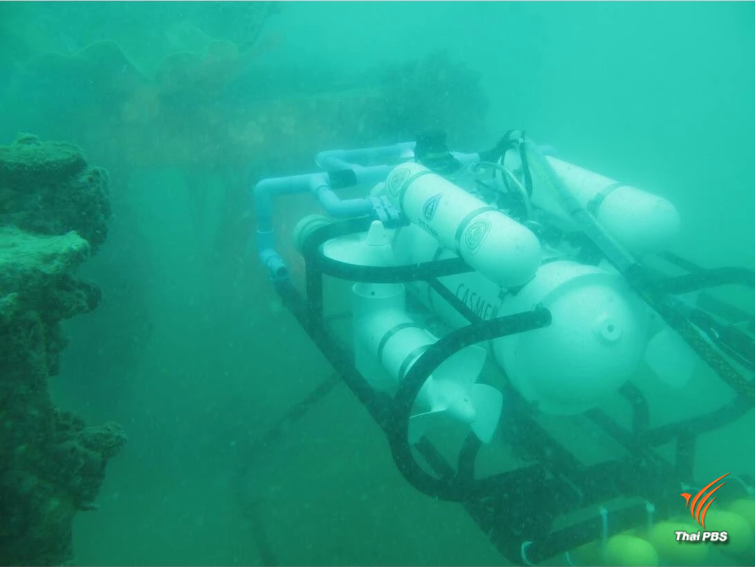 “He can stick his submarine where it hurts,” Mr Unsworth told CNN when asked what he thought of the invention. “It had absolutely no chance of working,” he said. Mr Unsworth said Musk had no idea of what the cave passage was like. “The submarine, I believe, was about five foot six long, rigid, so it wouldn’t have gone round corners or round any obstacles,” he explained. Mr Musk had tweeted about the rescue and the device his team had built for days last week as Thai authorities and an international team were working against the clock to extract the boys and their coach from the caverns. When asked about the mini-sub, rescue command chief Governor Narongsak Osotthanakorn said it was not suitable for the mission. His comments apparently irked Musk. The Meteorological Department has warned people across the country to brace for intense rains, with heavy rains in some parts of the northern, northeastern, central, eastern and southern regions which may result in flash floods starting tomorrow until July 19. During the July 13-19 , waves in the Andaman Sea are expected to be 2-3 meters high due to strong wind, sailors and fishermen were warned to exercise caution when venturing out to sea while small boats were told to stay put. The Gulf from Nakhon Si Thammarat upward will also experience rough sea. People living along the western coast of the southern region and the eastern coast were told to brace for danger from strong wind and high waves pushing toward the shoreline. The turbulent weather was attributable to monsoon trough blowing through the upper part of northern Laos and Vietnam toward the low-pressure cell over Tonkin Bay while the southwestern monsoon which is looming over the Andaman Sea and the Gulf is gaining strength. Members of the public can keep up with weather updates by calling the Weatherman hotline at 1182 around the clock or log into its website http://www.tmd.go.th . The National Legislative Assembly today passed in three straight readings a bill to transfer 12.7 billion baht from the 2018 budget to a central fund for development under the 20-year national strategy and the country’s reform in 11 fields. 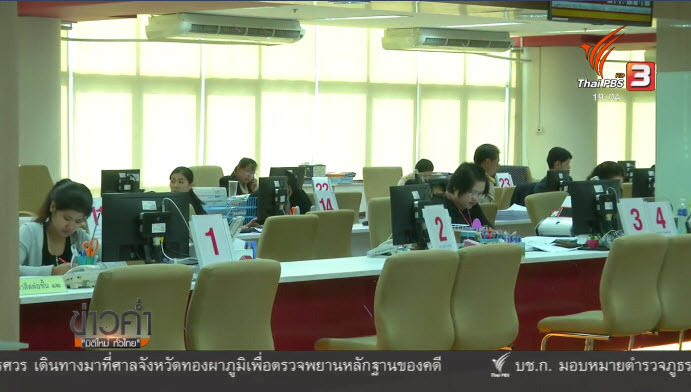 The 12.7 billion baht to be transferred to the central fund is from allocations from the 2018 budget for government agencies, state enterprises and other agencies. Deputy Finance Minister Wisut Srisuphan explained to the NLA that the bill is a necessary tool for the government to steer development plans under the 20-year national strategy and work for the country’s reform in 11 fields. Under the bill, 10 billion baht is for emergency use for the steering of the 20-year national strategy and 2.7 billion baht for the country’s reform in 11 fields. The NLA passed the bill into law in three straight readings with a vote of 138 with 3 abstentions. Wild Boar is the SEAL’s code word and the name of the soccer team whose 12 members and their coach were stranded in the cave since June 23. Thai authorities and international rescue teams launched the final phase of the rescue mission this morning to bring out the 5 remaining survivors today. Eight others have already been safely extracted from the cave over the past two days. Ambulances and helicopters have been on a standby since this morning to rush the remaining survivors to Chiang Rai hospitals to join their teammates who are still under medical care there but are reported to be in good health. A soldier was killed in a gun attack in Cho Ai Rong district of Narathiwat this morning, police said. A police investigation found that while Chief Warrant Officer Patchai Suree, 26, attached to the 41st mobile development unit, was travelling on a motorcycle from his house in Rangae district to his office in Sungai Padi district when he was followed by two men on another motorcycle. Police said the incident occurred at about 10am on Cho Ai Rong-Sungai Padi road in Tambon Marubo-ok. While passing a rubber plantation near Ban Cho Mong village, the pillion-rider of the trailing motorcycle fired five shots into the back of the soldier with a handgun, killing him instantly. Police were investigating. It was initially believed the attack was staged by Muslim militants. Although the three dead victims recovered today have yet to be identified, he said it was assumed that they were passengers from the ill-fated dive boat as they were found in the direction of the currents that flowed from the scene of the accident between Koh Heh and Koh Mai Thon off Phuket. Of the 11 still missing as of yesterday, the governor said he received confirmation from the immigration police and the Chinese consular office that three of the passengers listed as missing had already returned to China and two others were about to leave Thailand for home. Adding up with the three bodies recovered today, the actual number of missing has now been down to just three, said the governor, adding that sea and air searches for the missing still continue. Of the 44 dead, 37 of them have been identified and, of these, 33 of them were confirmed by their relatives. Dr Chirapat Taepant, Phuket public health official, said that 32 death certificates have been issued and 26 bodies are now ready to be claimed by their relatives in accordance with the set protocol, which includes a letter from the committee charged with releasing the bodies and a letter of approval from the Chinese consular office as well as death certificates. As for the body which is still stuck in the sunken Phoenix boat, Vice Admiral Somnoek Prempramote, the commander of the Third Naval Area, said stormy sea still poses an obstacle for divers to operate. Rescue operations commander Narongsak Osotthanakorn announced the successful extraction of four more “Wild Boars” soccer team members out of the Tham Luang cave and expressed confidence that rescuers would be able to bring to safety the last batch of five survivors tomorrow faster than they did in the past two days. Speaking at a press briefing at 9.30 pm, the former Chiang Rai governor said that the extraction mission today which began at 11 am was accomplished at 8 pm with four more teenage footballers being rescued out of the flooded cave and safely sent to Chiang Rai Prachanukroh hospital. The good news today, he said, was that the rescue team spent nine hours – two hours faster than they did a day earlier – from the time they went deeper into the cave to extract the four survivors until they emerged safely from the cave. For the final operation tomorrow, Mr Narongsak said the rescuers would use the same plan with some adjustments because the number of survivors to be extracted would be five instead of four as was the case for the last two days. Officials will have to spend about 20 hours preparing all the necessary support equipment, said the former governor, adding that he was confident the rescue team would be able to operate with greater ease and to shorten the time spent by between 4-5 hours. He said the last five survivors in the cave were in good health, adding that those who are now at the hospital could not eat fried rice yet because they will have to adjust themselves with the eating. All the eight rescued survivors are now quarantined in the clean ward of the hospital. Former Chiang Rai governor Narongsak Osotthanakorn announced Sunday night that four survivors were safely extracted out of the flooded cave and are now in the hands of doctors at Chiang Rai Prachanukroh hospital. As for the eight other survivors who are still stranded inside the cave, he said he could not say exactly when the next extraction operation would start, adding that it would be launched within the next 10-20 hours, depending on the conditions whether they are conducive for the launch of the operation. The ex-governor also pointed out that all the oxygen tanks which were previously placed at intervals along the rescue route in the cave from the forward command at Chamber 3 to the mound where the rest of the survivors are now sheltering have been used up and replacement oxygen tanks will be placed again. All teams who were involved in the rescue operations today would meet tonight to assess their operations today to find out the flaws if there are any and to fix them, said Mr Narongsak. Besides the 13 international divers and five Navy SEAL frog men who carried out the extraction mission to bring four survivors out to safety today, the former governor disclosed that about 90 divers – 40 from several countries and 50 Thais – were involved in the operations today. “This is just one step of achievement,” said Mr Narongsak as he described the success of the extraction operation today. Divers have begun an operation to try to extract the 13 survivors out of Tham Luang cave, chief of the rescue mission Narongsak Osotthanakorn announced at 10.30 am this morning. The Phuket Marine Office has issued an order prohibiting all boats from leaving the Ao Chalong bay to facilitate the search for 23 passengers still missing after two boat accidents on Thursday afternoon. According to the latest report of the search and rescue centre of the province, 33 passengers, most of the Chinese tourists, were confirmed dead and 23 still missing. The search, involving divers, navy soldiers, marine police, volunteers and officials from other agencie, was called off late on Friday night and was due to resume this morning. To facilitate the search, all boats are prohibited from leaving boat piers at the Ao Chalong without permission from the search and rescue command centre. France outclassed Uruguay 2-0 tonight to become the first team to advance to the semi-finals of the FIFA World Cup 2018. Raphael Varane scored with a header in the 40th minute. In the 61st minute Antoinne Griezmann put in a powerful free-kick shot that went straight to Uruguay goalkeeper Fernando Muslera who failed to stop the ball. Uruguay went into the game without key striker Edinson Cavani, who was ruled out with a calf injury. A search will continue today for 58 people, most of them tourists, who are still missing after three accidents in strong seas off Phuket involving two jet skis, a dive boat and a yacht on Thursday (July 5) afternoon, according a message posted on Facebook page “Phuket Public Relations” on Friday morning. In the message, Phuket governor Norapat Plodthong made a conclusion out of reports from authorities involving in the search and rescue operations that one person was killed, 11 injured (2 seriously), and 58 missing. In the first accident, two Russian tourists who went out for jet skiing went missing near Koh Racha in rough seas. They were later rescued by fishermen. In the second accident, a yacht named Seregina with 42 people on board (35 tourists, five crew members, one guide and one photographer) went down between Koh Heh and Koh Mai Thon. Forty had been rescued. Two were still missing – a boat engineer named Aroon Hasanbin and a Chinese tourist. In the third accident, a dive boat named Phoenix with 105 people on board (93 tourists and 12 crewmen and guides) sank near Koh Heh. Altogether 48 — 36 tourists and 12 crewmen and guides — were rescued. The body of a tourist from the boat was found near Koh L. Still missing were 56 tourists. To conclude, 58 people — 57 tourists and an engineer — are still missing. Mr Norapat, the Phuket governor, said in the message that the provincial authorities will today continue to work with sailors from the 3rd Naval Area, marine police, and fishing boats in a search for the missing 58. On July 6, helicopters from the 4th Army will join the search, he said. Voralak Rerkchaikal, the owner of the dive boat Phoenix, said her company would cooperate with the ongoing efforts to look for the tourist. The company will be responsible for paying compensation for the injured and the killed and other costs which may incur. The company will also help take the bodies of the killed to their hometowns for religious rites, she said. Forty-nine people are still missing while 89 others were plucked from the rough sea off Phuket this afternoon after one dive boat and a yacht capsized. Phuket governor Norapat Plodthong said at about 9 pm search teams were still looking for the remaining 49 people from the two ill-fated vessels. It was reported that the dive boat with about 90 divers and their dive masters capsized off Koh Hey (Hey island) whereas a yacht with 39 passengers and crews went down in the stormy sea off Mai Thon island. Rescue boats were rushed to their rescue off the two islands and managed to pluck from the sea altogether 89 people from the two vessels. Of the 89 people, nine of them were injured and one in serious condition. Two Russian tourists were also saved after their jet-ski capsized off Racha island. The Royal Thai Navy has sent some of its vessels to join in the search and rescue operations. Governor Norapat said that several tourist boats left Phuket in the morning as the weather was fine, but there was strong wind in the evening, causing the two vessels to capsize. A search was immediately ordered after an army Cessna 182 light plane disappeared from the radar screen and believed to have crashed. The four-seat, single-engine light plane took off from Mae Hong Son airport at 10.56 am today on a routine surveillance mission and later disappeared from the radar screen as it was about 20 miles to the north of the airport. Third Army Region commander Lt-Gen Vichak Siribansop said he ordered a plane to be flown to try to locate the missing plane, adding that the pilot had reported the sighting of smoke billowing from a spot near Ban Huey Poeng, Tambon Huey Pha in Muang district of Mae Hong Son. A ground search team from the 17th infantry regiment was immediately dispatched to the crash site to search and rescue the four people on board, including one pilot, one assistant pilot and two passengers. The four officers were identified as Lt Khemarat Duangkaew, Lt Virote Plangkrathok, Lt Naruphol Pookthong and Mst-Sgt Natchanan Khernkaew. A bill to empower His Majesty the King to handpick members of the Sangha Supreme Council, the supreme governing body of Buddhist monks in Thailand, sailed through the National Legislative Assembly today. The NLA unanimously passed the bill to amend the Sangha Supreme Council Act in three straight readings by 217 votes with four abstentions. The bill seeks to restructure the Sangha Supreme Council by removing the council’s power in selecting council members by placing the power to His Majesty the King. It also seeks to do away with the practice that makes senior monks with the rank of Somdet Phra Rachakhana to be ex-officio members of the council. Under the bill, the King will handpick well-qualified senior monks to fill the 20 seats in the council. The King will also have the power to remove any members of the council. The bill will become effective after its publication in the Royal Gazette. It will replace the existing act which empowers the council to wield full control of monastic affairs and the selection of council members. The term of the current members of the council will end in two months after which the King will appoint new members with the prime minister countersigning the appointments. The shakeup of the Sangha Supreme Council follows corruption scandals implicating three council members and several other senior monks. The three council members have been removed by the Supreme Patriarch and their titles stripped by HM the King. Investigations into the temple fund embezzlement scandal are still ongoing. The Cabinet today decided to maintain the value-added tax at 7 percent for another year as of October 1. Mr Natthaporn Jatusripitak, spokesman of Deputy Prime Minister Somkid Jatusripitak, said the Cabinet was concerned that increasing the VAT rate might impact the overall economy, investments and domestic consumption. Increasing the VAT rate above 7 percent as the country’s economic performance is improving would slow down the economy and push up the prices of consumer products and services, said Natthaporn, citing the cabinet’s concern. The freezing of VAT rate at 7 percent for another year will cause the state to lose 258,500 million baht in revenue, but this will not impact on the government’s budget for 2019 fiscal year, noting that the government has opted for deficit budget next year. The Thai Embassy in Jakarta, Indonesia, has advised Thai people who plan to travel to Bali to check information on flights to the resort island before departure. The advisory was issued after Mount Agung volcano erupted on Monday (July 2), spewing ash and smoke, and an earthquake measuring 5 on the Richter scale shook Bali on Tuesday morning. However, the Ngurah Rai international airport in Bali stays open as usual. In this situation, the Thai Embassy in Jakarta advises Thai people to check information on flights to and from Bali on websites https://bali-airport.com/en and https://twitter.com/baliairports. They can also contact the honorary consulate in Denpasar with emergency number +62 812 3825542 and the Thai embassy in Jakarta number +62 811 186253 for information around the clock. The Bank of Thailand will put new 500 and 1,000 baht banknotes in circulation on July 28 to mark His Majesty King Maha Vajiralongkorn Bodindradebayavarangkun’s birthday, BoT governor Veerathai Santiprabhob said on Tuesday. The front of both the new 500 and 1,000 baht banknotes show a portrait of King Vajiralongkorn in an air force commander uniform. The back of the 500-baht banknotes features a portrait of King Rama VII and King Rama VIII in pairs , while the back of the 1,000-baht banknotes show a portrait of King Bhumibol and King Vajiralongkorn. Since the banknotes of these two dominations are of a high value they are produced using special technologies to prevent forgery. Mr Veerathai said the two new banknotes are available at all commercial banks and financial institutions from July 28. SEAL rescue teams have found all the 12 missing young footballers and their coach lost in Tham Luang cave in Chiang Rai after nine days of painstaking search and rescue mission, Chiang Rai Governor Narongsak Osotthanakorn confirmed. His announcement was greeted with an eruption of cheers from journalists and volunteers waiting anxiously for news about the fate of the boys. He told a hastily-called press briefing at around 10.30 pm that the boys were all found alive at a spot near Pattaya Beach. The governor said a team of doctors will be immediately sent in to check their physical conditions. He said he would be able to say when the boys would be brought out of the cave in four hours after a medical check-up. He quoted a report from the SEAL rescue teams that they were all found at a spot about 400 meters away from Pattaya Beach, an elevated ground deep inside the cave. The 12 missing young footballers and their coach who have been missing in Tham Luang cave since June 23 have all been found, Chiang Rai Governor Narongsak Osotthanakorn announced. He said the boys were found at a spot near Pattaya Beach, quoting a report from the SEAL rescue team. He said their evacuation will be made after a medical check-up. Evacuation of survivors from Tham Luang cave to hospitals will be carried out by helicopters instead of by ambulances so that they can reach the Chiang Rai hospital within just 15 minutes. Dr Thongchai Lertwilairattanapong, Zone 1 public health inspector, said Sunday that the evacuation plan from the cave to hospitals has been adjusted by using helicopters instead of ambulances as earlier planned. He explained that travelling by ambulances from the cave to Chiang Rai provincial hospital would take about an hour while travelling in helicopters would take just 15 minutes. According to initial assessment of the health of the 13 boys and coach, Dr Thongchai said it was presumed that all of them are weak for lack of food and drinking water for more than a week. And if they have wounds on their bodies, he said they would first-aid treatment at the field hospital at the cave before they are to be flown to hospitals. He said that the survivors might develop breathing problem because they were in the cave with high humidity and they also would problems adjusting to bright light after having spent days in darkness. As for the families of the 13, the doctor said they were in high spirit and with hope after Prime Minister Prayut Chan-o-cha gave them moral support and were given counselling by doctors. However, he admitted that there are a few parents who feel stressed. Rescue teams continued to drain water out of Tham Luang cave throughout the night and are encouraged by the receding water level as the search for the 12 young footballers and their coach trapped inside the cave resumes this morning. Though weather conditions around the area appear clearer this morning, there are still worries about possible more rain. Thai PBS news team reported that attempts are being made to locate spots through which rain water can flow back into the cave and block them. The rescue teams will today continue to search for shafts that will help them reach inside the cave. A Navy SEAL team yesterday was able to land at an area known as chamber 3, from where it hopes to advance further to the so-called Pattaya Beach, where the missing 13 are believed to be taking refuge. The search is now in its second week. Meanwhile, authorities will today impose new order on the traffic flows in areas around Tham Luang cave after an evacuation exercise yesterday found that ambulances were hampered by vehicles parked along the paths used as evacuation routes. There were several shortcomings in the evacuation drill conducted at the Tham Luang cave site this morning which need to be fixed, Chiang Rai governor Narongsak Osotthanakorn said after an assessment of the exercise. The drill simulated a situation of evacuation starting from the survivors being brought out of the cave, taken onto ambulances, screened of their conditions and delivery to waiting helicopters. The conditions of the survivors are classified into 13 levels with the first 1-12 levels being classified as normal and the 13th as “red” which requires utmost attention. The governor said the drill confronted organizational problems, such as the first ambulance could not get out of the cave area because the road was blocked by other vehicles which are not involved in the search and rescue operations and that ambulances from outside the locality were not familiar with the route to the cave. “If the real evacuation is confronted by similar problems that ambulance cannot get in or out and the doctors and nurses have to take a walk, then we will be exhausted. These problems, though minor, should serve as a lesson,” said the governor. The governor also pleaded with the media to exercise caution in their news presentation, especially regarding interviews with experts or academics. “If necessary, do not livestream especially on some issues,” said the governor, adding he might invite some media people out of the area if they continue to defy his warnings. Meanwhile, two huge Phayanark water pumps sent from Nakhon Pathom arrived at Tham Luang cave Friday night and two more are expected today to help speed up the draining of water out of the cave. Chiang Rai public relations office on Saturday livestreamed in its Facebook page the operation of one of the four giant water pumps which was already installed outside the cave. An official manning the water pump said that the water pump was capable of draining water faster and with bigger amount of water than the previous ones. “I would like to see the footballers so I brought the water pumps here,” said an official manning the pump, claiming that it could pump water out of a pond which is two and a half rai in size and about two metres deep in just one and a half hours. 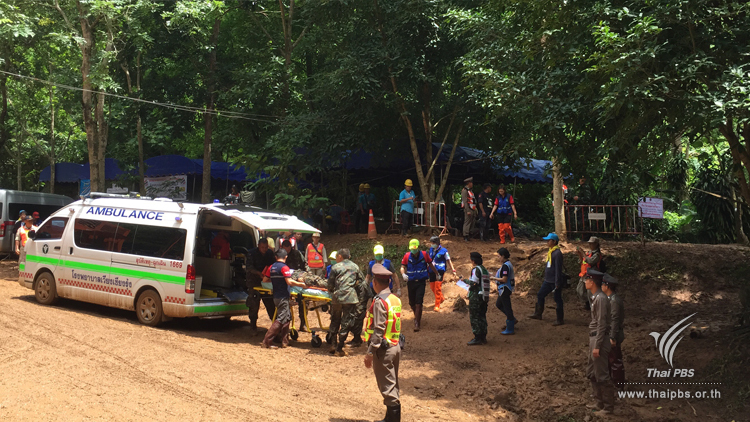 Rescue teams have begun a simulation drill to evacuate survivors from Tham Luang cave to a district hospital nearby in Chiang Rai. atched by an army of journalists and camermen. Authorities have prepared 3 ambulances for the drill. Helicopters are also being employed for emergency. Chiang Rai governor Narongsak Osotthanakorn said Friday that the drill would involve officials in different fields. Each of the ambulances is manned with doctors and nurses in a drill to simulate a situation in which all the missing 13 are rescued out of the cave. “Do not get excited, we will just simulate a situation about delivering patients to the hospital if the media and the public see many helicopters and ambulances in front of the cave,” said the governor. Former permanent secretary of the Ministry of Social Development and Human Security Mr Puttipat Lertchaowasit died at his residence in Pathum Thani after taking poison in what is believed to be a suicide. His wife also took poison but was still alive when both were rushed to Pathumthani hospital this morning. She was in critical condition. The former permanent secretary was dismissed after he and his deputy were found to be involved in the controversial corruption of state budgets allocated to the destitute and the handicapped nationwide. Both were found to be lying on the bed when charity foundation workers were alerted. The prime minister in February thus year ordered an abrupt transfer of Mr Puttipat Lertchaowasit and his deputy, Narong Kongkham to facilitate the ongoing investigation into alleged widespread corruption in the spending of the fund for the destitute by over 30 centres for the protection of the destitute across the country. The probe is jointly undertaken by the Office of the Auditor-General and the Public Sector Anti-Corruption Commission (PACC). Investigation by the OAG found there was bases of corruption in the use of the fund for the destitute since Mr Puttipat was director-general of Welfare Development Department. The PM’s transfer order mentioned that some senior officials of the Ministry of Social Development and Human Security might be involved in the alleged corruption and a panel would be set up to further investigate the case to ensure fairness to those implicated. The two officials’ new posts are senior advisors to the Prime Minister and will report to Deputy Prime Minister Gen Chatchai Sarikulya. The United States has expressed worries about the young Thai soccer squad that is being trapped in the Tham Luang Cave in Chiang Rai. The statement said the United States Pacific Command (PACOM) has sent a search and rescue team at the request of the Royal Thai government to assist in locating the group. 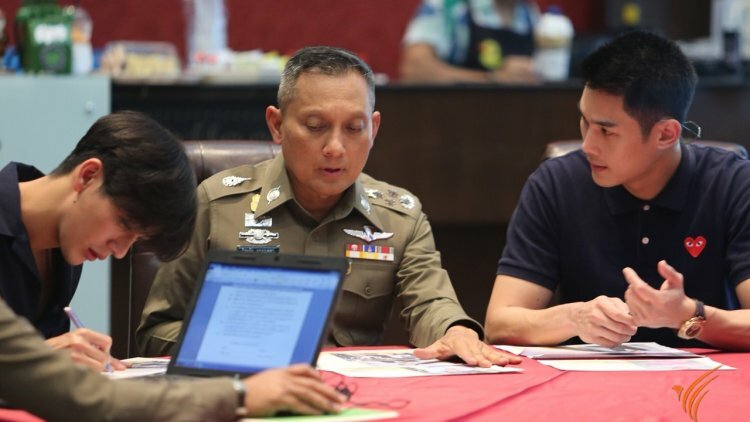 “The United States team is now in Chiang Rai and delivers search and rescue experience and capacity to the already tremendous efforts underway by Thai authorities. We hope the players and their coach will be brought home quickly and safely,” it said. 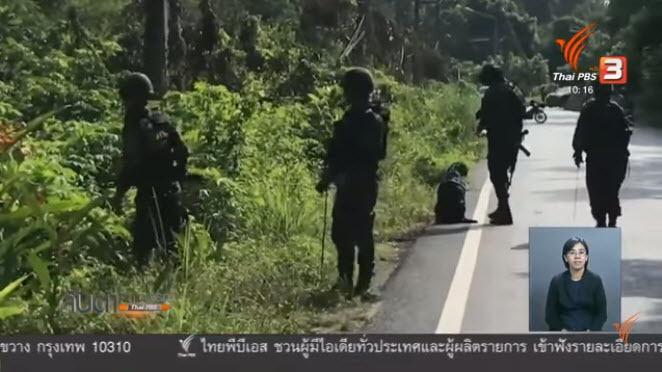 One of the three hunters wanted by the police for allegedly killing a gaur at Ang Rue Nai wildlife sanctuary in Chanthaburi’s Kaeng Hang Maew district last week has been arrested. The suspect, 24-year old Rungroj Pokham, was presented at a press conference held at Chanthaburi provincial hall by governor Witoorat Srinam. Police also seized from Rungroj’s possession one shotgun and three bags used to contain the gaur meat. Rungroj told the media that he decided to turn himself in to the police because he could no longer stand the pressure exerted by the police. He allegedly admitted that he used his own shotgun to shoot the gaur because he wanted its meat for food. He told the police that his two accomplices were Cambodians, one of them identified as Dum. He was charged with illegal hunting in wildlife sanctuary, illegal possession of firearms and carrying a gun in public without proper reason. The gaur weighs between 300-400 kilogrammes. Search and rescue operations continue throughout the night as rescue teams race against time to reach the 13 trapped footballers and coach who are still missing since they went into the cave on Saturday. The Seal frog men who led the search because of their underwater skill and expertise decided to settle inside the cave to carry on with their search and will not pull out to the cave entrance as they did in the previous nights. Electrical cables were installed at the Seal team’s base camp to provide lighting and, at the same time, to power water pumps which were set up near the camp to pump water out of the cave which will hopefully facilitate the operations of the Seal’s frog men. It was reported that the Seal team would be resupplied with food, oxygen tanks and other necessities by border patrol policemen without the need to get out to the entrance of the cave. Meanwhile, another combined team of about 60 police, military and rescue workers were ordered to trek on foot toward a tunnel at a cliff face which was believed to be able to get into the cave and to “Pattaya Beach” sand dune at a cave chamber where the 12 footballers and a coach were believed to be taking refuge to escape rising water. National Legislative Assembly chairman Pornpetch Wichitcholachai believes a general election will be held in February next year as earlier said by Prime Minister Prayut Chan-o-cha. Mr Pornpetch said this on Tuesday (June 26) although it was concluded after a meeting between the government and political parties on Monday that the earliest date for the general election would be Feb 24 and the latest date May 5, 2019. The NLA chairman said he personally believed that the election would be held in February as Gen Prayut earlier announced. He said it was not necessary for the Election Commission to take as long as 150 days to prepare for the election as it usually took only 60-90 days. He hoped the EC and political parties would be able to go through various procedures in time. On a suggestion by some political parties for the primary votes to be exempted, Mr Pornpetch said all concerned must look into the constitution to see whether or not the requirement can be waived by using Section 44. He said that if the government asked the NLA for a way out regarding the primaries he would have to consult with other NLA members for a resolution. Mr Pornpetch also said although the selection of a new Election Commission is still in process, this would not affect the election as the incumbent EC could handle it. He said the NLA is scheduled to vote to select a new EC on July 12. He believed the new EC would be able to take over the job from the old one without problems. The Minburi Provincial Court on Tuesday issued warrant for the arrest of a lawyer after he failed to appear in the court to hear the verdict of the Appeals Court in the murder of former national marksman Chakkrit Panitchpatikam in October 2013. The wanted lawyer Santi Thongsem, or known as “Tanai Id” is among five convicts sentenced by the Minburi court for the murder consplracy of Chakkrit or “X Chakkrit”, a former national marksman. At the court today, four convicts appeared to hear the verdict of the Appeals Court to be read by the Minburi Provincial Court, except Tanai Id. His disappearance prompted the Minburi Court to put off reading the verdict of the Appeals Court to August 7. The court reasoned that since the lawyer did not produce reason for not attending the court session today, it then considered he had intention to escape. It issued warrant for his arrest. Earlier the Minburi Provincial Court sentenced the hired gunman Chirasak Klinklai, and motorcycle rider Thawatchai Phetchoti to life, while Tanai Id and Chakkrit’s wife Dr Nithiwadee Poocharoenyos or “Mor Nim” were sentenced to death. Mor Nim’s mother was was also arrested for alleged hiring the gunman to shoot her son-in-law Chakkrit. But the court found her not guilty and ordered her release. Navy Seal rescue teams are racing against time and rising water to find and rescue the 12 footballers and a coach trapped deep inside the Tham Luang-Khun Nam Nang Non cave. Chiang Rai deputy governor Pasakorn Boonyalak told the media at about 4 pm that he was confident that the 13 are still alive after Navy Seal rescue teams have found foot and hand prints on the dry ground inside the cave where water has not yet reached. He said all the 13 are sportsmen and must be trying to find their way out. Meanwhile, a new question has emerged – that is how to get the 13 out of the flooded cave if they are still alive because some sections of the underground cave are completely flooded as deep as five meters. Mr Pasakorn said that rescue teams had adjusted rescue techniques which include training the 13 how to use a scuba gear in case they have to dive out of the flooded cave in case they are found alive. Or they are made to wait on the high ground inside the cave and a tent to be set up there until water has receded to a safe level that they can wade through to get out. The deputy governor said that Navy Seal teams are about two kilometers away from the end of the tunnel and they expect to take an hour walk to reach the destination. Meanwhile, at about 3.30 pm, a helicopter was dispatched to survey areas above the cave after some villagers who are familiar with the terrain said there is at least a tunnel which can access to the cave. The chopper has located the tunnel as claimed by villagers and officials in the aircraft dropped food and bottled water into the tunnel plus hand-written note calling the 13, in case they found the dropped food, to wait there for Seal teams who will try to reach them. The tunnel is about 800 meters from the first chamber of the cave, but the route inside the cave is zigzag and can be longer than 800 meters. Mr Kamonchai Kotcha, director of the Office of Conserved Area in Chiang Rai, said that the cave is not open to the public and anyone who wants to get in must first notify park officials, especially during the rainy season when the cave can be flooded. Also, there is a sign at the cave entrance, saying that no entry unless there is a permission. Meanwhile, at the entrance of the cave, preparations have been made with life-saving gears on standby to be provided to the survivors if need be. Also, a helicopter of the border patrol police is on standby to be flown in to bring the survivors to the nearest hospital. Twelve young football players of Moo Pa Academy team and their coach Ekapol Chanthawong went inside Thamluang cave in Tambon Pong Pha district of Chiang Rai’s Mae Sai district for a sightseeing trip on Saturday (June 23) afternoon. They were later believed too have been trapped inside the cave in the Thamlung-Khun Nam Nang Non National Park. The following is the timeline of the incident. 10.42am: Coach Ekapol Chanthawong posted on his Facebook page a 5-minute video of live training of the football team. 3.00pm: Park officials, before closing the park’s office, spotted 11 bicycles left in front of the cave entrance. 5.00pm: The parents of one of the football players called their son on the phone. They learned that their son and friends were inside the cave. 9.30pm: Siam Ruam Jai Mae Sai Foundation was informed by the chief of Ban Chong that a number of young footballers aged 11-16 went missing in the cave. 10.00pm: 191 radio center of Mae Sai police was informed that a number of footballers had gone missing in the cave. A police patrol from Tambon Pong Pha was dispatched to the scene. 1.00am: Siam Ruam Jai and Samakom Sirikorn rescue teams went into the cave with rope and oxygen tanks. 3.00am: The rescue teams withdrew from the cave. They found inside the cave 12 pairs of sandals and a number of backpacks at a spot inside the cave. 3.30am: The two rescue teams held a joint meeting with administrative officials, national park officials, police, soldiers and local leaders. The meeting agreed to temporarily stop the search and the rescuers had become tired and the water level in the cave continue to rise. 4.00am: The search was temporarily suspended. 8.00am: Altogether seven rescue teams of the National Parks Department and Mae Sai district went inside the cave against. They planned to pump water out of the cave but could not carry out the plan as the water kept rising. 1.00pm: A team of divers examined the cave, which was about 5 meters underwater. They went for a distance of only 15 meters and decided to withdraw. 6.00pm: Prachan Meeboon, the rescue director of the National Parks Department reported that the divers had problems. They contacted the navy to send a Seal team of 16 frogmen to join the search. 00.10am: A combined team of 10 soldiers and border patrol police went into the cave. 01.45 am: The Seal team arrived at Mae Fah Luang – Chiang Rai International Airport (CEI). 02.45 am: The Seal team split into 4 groups, the first group went into the cave jointing the previous rescue team. 08.30 am: The Seal team blasted the sand out of an underwater passageway and able to access the other side of the cave which expected that the missing group will be at this point. However, they had found no sign of the missing group. The Office of the Council of State (Krisdika) is seeking public opinions and monks on the proposed amendments of the existing Monastic Act with an aim to restructure the Sangha Supreme Council. Opinions can be sent to the office of the Council of State at www.krisdika.go.th now until June 27. The council’s move follows the cabinet’s unannounced decision last Tuesday to approve proposed amendments to the monastic law regarding the Sangha Supreme Council in wake of the temple fund scandal which has dented the reputation of the monastic governing body and affected public faith in the monastic order. Three members of the council namely Phra Phrommasith, abbot of Wat Saket and Region 10 Chaokhana; Phra Phrommethi, assistant abbot of Wat Sam Phraya; and Phra Phrommadilok, abbot of Wat Sam Phraya were dismissed from the Sangha Supreme Council by an order of the Supreme Patriarch in May after they were arrested by the police for alleged involvement in temple fund embezzlement. Several other senior monks are being implicated in the scandal. The proposed amendments call for a restructuring of the Sangha Supreme Council with the abolition of the ex-officio memberships reserved for senior monks with the rank of Somdet Phra Rachakhana and empowering His Majesty the King to exercise his prerogative to appoint members of the Sangha Supreme Council from well-qualified senior monks. HM the King will also be empowered to relieve members of the council. In accordance with the Monastic Act B.E. 2502 which is still enforceable, the Sangha Supreme Council is made up of two groups of monks – one group consists of monks with the rank of Somdet Phrarachakhana who are ex-officio members of the council and the other group whose members do not exceed 12 are appointed by the Supreme Patriarch from senior monks with the rank of Phra Rachakhana to be in the office for a two-year term. It was also reasoned that since Somdet Phrarachakhana monks are mostly in their old age who may have a health problem, making it not possible to attend council meetings on regular basis and some of them have to take a break for a long period of time. The other senior monks in the council may also experience similar health problem. Another reason cited for the major revamp of the Sangha Supreme Council is the temple fund scandal which has implicated several senior monks, affecting public faith in the monastic order and the credibility of the monastic governing body. The incumbent remaining members of the Sangha Supreme Council will stay on in the offices until the appointment of a new set of council members by HM the King. Police in Chiang Mai on Saturday detained a South Korean on a charge of conspiring with the other people to kill his stepmother said by police to be a billionaire in South Korea. Pol Col Sitthisak Siridet-anan, superintendent of Mae Ping district police, said that police had sufficient evidence to substantiate the charge against the 54-year old Mr Ben Lee for involvement in the murder of 76-year old Mrs Al Jung-ja at a luxury house in Mountain View housing estate in Tambon San Phisua, Muang district of Chiang Mai on Thursday. Earlier, police arrested Ben Lee’s wife, Ms Park Song-hee, who was accused of knifing to death Mrs Al Jung-ja in her bedroom at the house. Ms Park is currently being treated at the district hospital for some injuries. Pol Sitthisak said that about nine months ago, the couple brought Mrs Al Jung-ja from South Korea to Chiang Mai for rehabilitation. He added that the aging woman and her daughter-in-law did not get along well and often had quarrels with each other because the former was very disciplined as evident from the various house rules which she pasted up at different spots in the house. The colonel went on saying that Ben Lee was the first person who informed a guard at the housing estate about his step mother’s death. Ben Lee also notified the South Korean consular’s office in Chiang Mai about the incident, he said. Ben Lee told the police during the interrogation that he saw the fight between the two women and tried to intervene, but it was too late to prevent the killing. But police suspected that the wounds on Lee’s wife’s body were self-inflicted. The Supreme Court’s Criminal Division for Holders of Political Positions on Thursday handed down one-month jail term without suspension on Chuwit Kamonvisit, former list MP of Rak Prathet Thai party, on a charge of declaring false statement about his assets and liabilities. The court found Chuwit, currently outspoken commentator of Thai Rath Channel 22’s Tee Saekna programme, guilty of violating anti-corruption law B.E. 2542 which requires MPs to declare their assets and liabilities. The court initially sentenced him to two months’ imprisonment but commuted it by half to one month for his confession to the charges. It said that the imprisonment could not be suspended because Chuwit had served a six-month jail term for offences relating to the forced eviction of beer bars on his land plot on Sukhumvit road and he has left the prison not exceeding five years. The National Office of Buddhism (NOB) yesterday dismissed the allegation that it was sending out instruction to monks across the country to absolutely not handle any money personally. The allegations led to sever conflict between the NOB and the Sangha Supreme Council of Thailand and could possibly lead to monk rallying. Coming out to dismiss the allegations was Pol Lt-Col Pongporn Phramsaneh, director of the National Office of Buddhism (NOB). He said the NOB does not have any authority to send out instructions to monks. Instead, he urged the public not to listen to rumors and allegations that the NOB is making attempts to identify temples where monks have managed to maintain the hands-off rule. These are propaganda being circulated by certain factions to incite unrest within the Sangha Supreme Council of Thailand. But he confirmed that monks have abstained from handling cash which is in line with the Buddhism rule. The public should not overact, he said and stated that a lot of times news circulated are unverified and are merely rumors. They should wait for clarification from the Sangha Supreme Council of Thailand concerning such news to avoid confusion and misunderstanding. With regards to an outcry from the public for the NOB to accelerate its investigation to the corruption charges, he assured that the NOB is continuing its effort and has no intention of letting the case remain open. Suspects have already been identified and dismissed from the civil service. A few suspects involvement require further verification, he said. He went on explaining that charges have been categorized to two separate allegations. Firstly civil officers that have misappropriated temple funds will be charged with misconduct unbecoming a civil servant. The second allegation would be temples that have intentionally moved appropriated budgets provided by the NOB which will be charged with money laundering. He stressed that all found guilty will be charged to the full letter of the law without exceptions. Withaya Nititham, an AMLO official, submitted a petition and evidence against Mr Putthipat and the former female ministry official, who were alleged to have been involved in the embezzlement of welfare funds for the destitute and the poor. Mr Witthaya said the AMLO had found in its investigation that Mr Putthipat and the woman, whom he did not identify, had transferred the stolen money to other people. He declined to reveal their identifies or whether they were relatives of the two and how much money had been transferred to them. He said only that the stolen money had been used to buy cars and real estates. As for the 10 ministry officials whose assets had been seized by the AMLO, they were required submit in writing in 30 days to explain how the assets had been acquired. If they were not able to provide a clear explanation, the assets would be confiscated, Mr Witthaya said. In April, Mr Putthipat and his deputy, Narong Kongkham, were temporarily relieved from civil service pending investigation into their alleged involvement in the stealing of funds for the destitute and the poor. North Korean leader Kim Jong Un is making a two-day visit to China, Chinese state media said on Tuesday. It is his third visit to China in three months. China Daily said, Kim, who is chairman of North Korea’s State Affairs Commission, will be in China on Tuesday and Wednesday, but gave no details. This would be his third visit to China since March and it follows his recent summit with US President Donald Trump in Singapore on June 12. China is known to be North Korea’s closest ally and supporter. Sweden defeated South Korea 1-0 in its first opening World Cup game since 1958. It did so with the help of the Video Assistant Referee system which Salvadoran referee Joel Aguilar was called to consult after Kim Min-woo brought down Viktor Claesson in the box in the 65th minute. It was centre-back Andreas Granqvist who put the ball into the net. Aleksandar Kolarov of Serbia scored a free kick at the 60-minute mark to give the Serbians a victory over Costa Rica in the Russia 2018 World Cup Group E football match at the Samara Arena in Samara. Photo shows Serbia’s players celebrate their winning goal against Costa Rica. Small boats are warned not to venture out of the sea in the Andaman Sea and the upper part of the Gulf during June 16-20 because of strong winds and high waves while sailors are also warned to exercise special caution. 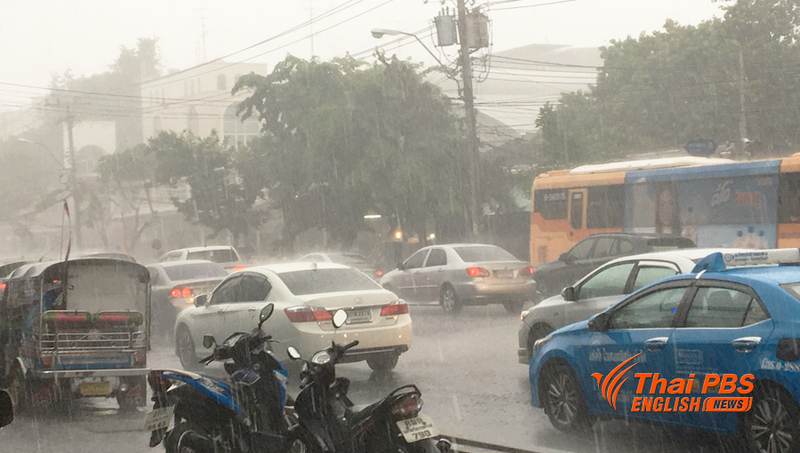 The Meteorological Department issued an announcement at 5 pm on Saturday warning of strong winds and high waves in the Andaman sea on the western coast of Thailand and the in the Gulf from Surat Thani province upward from Saturday until next Wednesday. It said that the waves in the Andaman Sea are between 2-4 metres high while in the upper part of the Gulf, the waves rise to 2-3 metres high. Households located along the beaches in the eastern region and on the western coast are also warned of the danger of high waves. A predawn fire broke out at the cultural performance stage of the famous Ayothaya Floating Market in the ancient city of Ayutthaya causing damage worth more than one million baht to the stage and the musical instruments. According to Ayutthaya police, the fire happened at about 6.30am on Saturday before the floating market will open to visitors. One security guard at the market said the fire incident happened as traders were preparing their stalls before the market would open at 8.00am. He said he heard explosion at the show stage where the light and special effect system was installed for cultural shows. The fire ripped through the stage quickly because it was mostly made of woods, and covered with thatched roofs. Firefighters were alerted and arrived shortly afterwards. The fire was put under control in half and hour but the main performance stage was complete burnt down. Forensic police inspecting the fire scene late this morning but still did not establish the exact cause of the fire. Initially they believed electrical short circuit at the stage lighting and special effect might be the probable cause. Thai Prime Minister Prayut Chan-O-cha welcomes leaders of the Mekong countries to the Ayeyawady-Chao Phraya-Mekong Economic Cooperation Strategy (ACMECS) Summit in Bangkok, including Thailand, Cambodia, Myanmar, Laos and Vietnam. 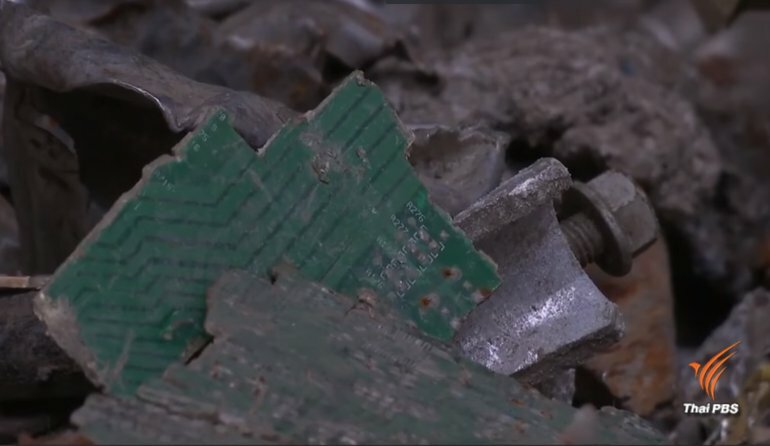 About 260,000 tonnes of trash, including 52,200 tonnes of electronic trash, were imported into Thailand during the January-May period this year compared to 116,000 tonnes imported for the whole of last year, said Customs Department spokesman Mr Chaiyuth Khamkhun. He attributed the substantial increase of imported wastes, especially from China, to the Chinese government’s ban on the importation of electronic trash and plastic trash for recycling. In anticipation of the rising trend of electronic trash and plastic trash to be imported from China and Hong Kong, Mr Chaiyuth said that a joint working group of the Customs and Industrial Works departments had decided to adopt six measures under the Basel Convention to control import of the two types of trash especially from China, which include the requirement that all containers of imported trash be X-rayed instead of random check as was the case in the past. Since the adoption of tougher measures, he said Customs officials had checked 73 suspicious containers and were in the process of returning 40 containers to countries of origin after five trash separation plants had their licenses suspended for defying trash import conditions. Of the 40 containers to be sent back, he said 33 of them were falsely declared to contain metallic trash. He disclosed that some unscrupulous importers had stuffed electronic trash in containers declared to contain metallic trash, making it difficult for customs officials to intercept electronic trash because inspection of metallic trash is not as tough as inspection of electronic trash. A cargo ship sank off Sichang Island while it was heading for Bangkok Port with about 70 containers of cargoes on board. The cause of the accident which happened shortly before midnight on Wednesday was not immediately known but the Department of Marine and the Royal Thai Navy have floated warning bouys to mark the sunken vessel and its sunken and floating containers for safety navigation. Four crew members of the cargo ship, named Pataranavi 6, were safely rescued and no injuries were reported. The Department of Marine has also set up an operation centre to salvage the floating containers. North Korean leader Kim Jong Un said today the world will see “a major change” after he and US President Donald Trump signed a “comprehensive” document outlining a commitment toward denuclearization on the Korean peninsula. Speaking after his summit with Kim, Trump said he and the North Korean leader have developed “a very special bond” and promised to give details about the meeting and the document in a press conference in the afternoon. Mr Trump said a turning point in US-North Korean relationship has been achieved. “We’re both going to do something, and we’ve developed a very special bond…we’re going to take care of a very big and dangerous problem for the rest of the world,” he said adding “It worked out far better for both of us than anybody could have expected,” he added. Ahead of the historic summit between United States President Donald Trump and North Korean leader Kim Jong-un on Tuesday, a coalition of human rights organizations from around the world sent a letter to the communist leader, urging him to undertake “meaningful reforms” to reverse the grave human rights situation in the country, The Korea Herald reported. Trump and Kim are due to hold talks — the first-ever between a sitting US president and a North Korean leader — in Singapore, with Trump describing the summit as a “one-time shot” at peace. Denuclearizing Pyongyang will top the agenda, while bringing a formal end to the 1950-53 Korean War will also be on the table. The paper said whether the issue of improving North Korea’s human rights situation will be discussed remains to be seen. “As the UN Security Council has recognized, human rights abuses in North Korea and threats to international peace and security are intrinsically connected, so any security discussion needs to include human rights,” said Brad Adams, Asia director at Human Rights Watch, on behalf of some 300 nongovernmental organizations, The Korea Herald reported. 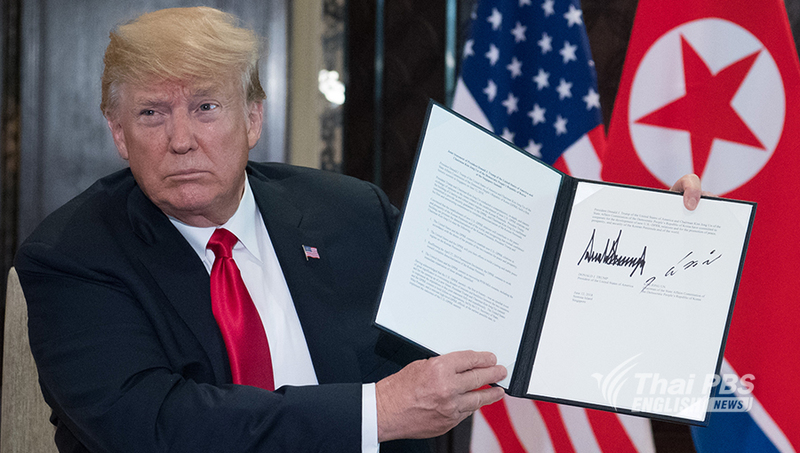 The letter was signed by 52 organizations, including coalitions representing more than 300 nongovernmental organizations from Asia, Latin America, Africa, Europe and North America. Five men who were relatives and friends were shot dead in a home in Bannang Satar district of Yala in the early hours of Monday in what security authorities believed was the work of southern insurgents. The massacre happened shortly after midnight at Tambon Tanorputeh in Bannang Satar district which was owned by Ibroheng Museh, 32, who was one of the victims. Security authorities said all the five victims were shot in the heads and the bodies inside the living room of Ibroheng. Police said the five persons, all men, were having talks in the room when a group of gunmen entered the house, and opened fire. Killed were Ibroheng and his relatives and friends identified as Aranchai Dorheh, 26, Usman Yusor, 39, Furegon Raso, 25, and Ahama Museh, 33. Security authorities suspected that the massacre might be the work of southern insurgents to blame government authorities in order to create public disorder before the end of the month of Ramadan. US President Donald Trump today thanked Prime Minister Lee Hsien Loong for Singapore’s role in hosting his summit with North Korean leader Kim Jong Un tomorrow. “We have a very interesting meeting in particular tomorrow, and I think things can work out very nicely. But we appreciate your hospitality and professionalism and your friendship. Thank you very much,” Trump told Mr Lee at the start of their working lunch. Trump and Kim arrived in Singapore yesterday for the historical summit which is scheduled to start at 9 am Singapore time on Tuesday. North Korea’s state media KCNA reported this morning that its leader Kim Jong Un and US President Donald Trump will discuss a “permanent and durable peace-keeping mechanism” on the Korean peninsula and denuclearisation of the Korean peninsula. “Wide-ranging and profound views on the issue of establishing new DPRK-US relations, the issue of building a permanent and durable peace-keeping mechanism on the Korean peninsula, the issue of realising the denuclearisation of the Korean peninsula and other issues of mutual concern, as required by the changed era, will be exchanged at the DPRK-US summit talks,” the Korean Central News Agency (KCNA) reported. The report in English also said Mr Kim is being accompanied by Foreign Minister Ri Yong Ho, Defence Minister No Kwang Chol and his sister Ms Kim Yo Jong. KCNA noted that the summit, the first between a sitting US president and a North Korean leader, will take place “under the great attention and expectation of the whole world”. Veterinarians tried unsuccessfully to save a green sea turtle which beached ashore at Laem Chabang deep-sea port last week, but managed to keep it alive for just two days before it died apparently from plastic scraps in its stomach. 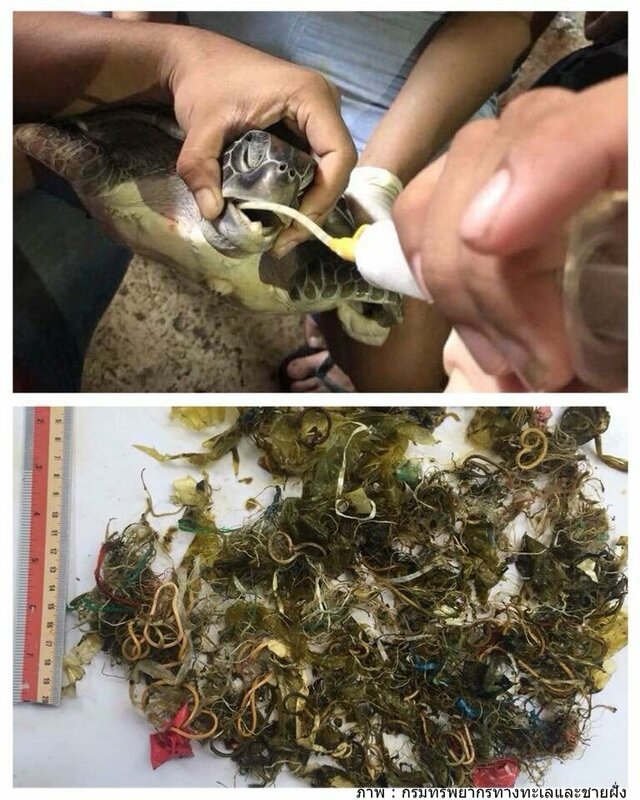 The green sea turtle was found on the beach of Laem Chabang port on June 4 and then it was sent to the Marine and Coastal Resources Research and Development Centre for emergency treatment. Veterinarians at the centre spoon-fed the turtle with liquid food and medication for two days before it succumbed to its death. They cut open its stomach to find out the cause of its death and found in its stomach a substantial amount of small plastic scraps such as plastic chords, plastic bags, fishing gear scraps and rubber band. The vets said that the beast lost appetite because of the alien matters in its stomach, had low level of protein in its body and fluid in its stomach, culminating to heart failure. On Sunday however another green turtle was found ensnared in a fish net in front of the beach of Dusit Thani Laguna hotel in Thalang district of Phuket. The young turtle which weighs about 7.5 kgs was later sent to the research centre of the Marine and Coastal Resources Department for treatment. The beast was found to have suffered from cuts on both sides of its fins, but the wounds were not serious. Vets at the centre said they expected the turtle to be recovered in the next couple of days and could be returned to the sea. People living in areas around the Chatree gold mine in Phichit province are expected to lodge a petition with Prime Minister Prayut Chan-o-cha when he visits Bung Seefai in Muang district of this northern province on Monday. An informed source close to the villagers said Sunday that the villagers who have been affected by gold mining operations by Akaka Resources Public Company, a subsidiary of Australian mining corporation, Kingsgate, would voice their opposition to any attempt to allow the resumption of gold mining operations at the Chatree gold mine and to demand authorities concerned to address health and environmental problems caused to their communities and residents. The prime minister plans to visit Phichit and a few other central provinces as part of his 4th mobile cabinet meeting. The source further said that the villagers would also voice their objection against any attempt to allow gold explorations in 12 provinces countrywide, including Phichit, Phitsanuloke, Lop Buri, Loei, Satun, Sa Kaew, Surat Thani, Chanthaburi, Rayong, Saraburi, Nakhon Sawan and Petchabun. The source also noted that a new problem had emerged after the Forest Department had demanded the return of land in Sak Lek district of Phichit occupied by about 1,000 households to be turned into forest. Gold mining operations at Chatree gold mine has been suspended since January last year by an order issued by the prime minister by virtue of Section 44 of the interim Constitution to put an end of the conflict between the mining company and villagers living around the gold mine who charged that pollutants and hazardous substances had been leaked out of the mine, threatening their health and environment. Kingsgate filed a lawsuit against the Thai government with the international arbitration commission over what it alleged as unfair suspension of gold mining operations by Akaka Resources and the matter is now under arbitration proceedings. Railway workers at Hua Lamphong railway terminal have been working since this morning (Sunday) to remove a derailed train carriage, to fix damaged rail tracks in order to restore normal train service. In-bound and out-bound train service at Hua Lamphong train station has been suspended after a carriage of Bangkokp-Kaeng Khoi train Noo 342 derailed as it was approaching the station. An official of the State Railway of Thailand the carriage derailed at the time when a mechanic shifted the rail track. The derailed carriage tilted one side, blocking both in-bound and out-bound rail tracks. There were three passengers in the derailed carriage, but none of them were hurt. All trains leaving Hua Lamphong station were suspended and in-bound trains with destinations at Hua Lampohong were forced to stop at Bang Sue or Samsen stations to allow passengers to disembark as workers tried to fix the problem. SRT originally estimated that the maintenance would take about three hours. More isolated heavy to very heavy rain will hit all regions of the country from today until June 11 as a strong southwest monsoon prevails over the Andaman Sea and the Gulf of Thailand while a monsoon trough is lying across Myanmar, Laos and Vietnam, according to the latest announcement of the Meteorological Department. – Prachuap Khiri Khan, Chumphon, Surat Thani, Ranong, Phangnga, Phuket and Krabi in the South. – Nakhon Nayok, Chachoengsao, Prachin Buri, Sa Kaeo, Chon Buri, Rayong, Chanthaburi and Trat in the East. Waves in the Andaman Sea and the upper Gulf of Thailand from Surat Thani and northward are expected to be 2-3 metres high. All vessels are advised to proceed with caution while small boats to stay ashore during June 8-11. People in coastal areas in the East and the South’s west coast are also advised to beware of storm surges. Prime Minister Prayut Chan-o-cha and his cabinet members will make an inspection trip to the lower Central provinces of Nakhon Sawan, Kamphaeng Phet, Phichit and Uthai Thani on June 11-12 and hold this year’s 4th mobile cabinet in Nakhon Sawan on June 12. Government House sources said since the four provinces are rich with natural resources and suitable for growing rice and other agricultural produce, the cabinet will attach importance to the rehabilitation and development of water resources for agriculture and maintenance of the eco-system. It will also look into the development of infrastructure and logistics as well as sources of production to reduce the production cost and increase income for farmers. On June 11, the prime minister, cabinet members and accompanying officials will fly on a C-130 cargo plane of the air force from the military airport in Don Mueang to the military airport of the air force’s Wing 46 in Phitsanulok. They will pay respects to the image of Luang Pho Phet at Wat Tha Luang in Muang district of Phichit province before proceeding to meet the people at the Bung Si Fai Lake, which will be developed to be the fifth largest reservoir in the country. Gen Prayut and his entourage will later visit the office for the rehabilitation of the Phichit river in tambon Yan Yao in Phichit’s Muang district. In the afternoon on June 11, they will take a special train from Chum Saeng station to Nakhon Sawan railway station to see the construction of a dual-track railway project between Lop Buri and Pak Nampho. They will inspect the rehabilitation of the Bung Boraphet Lake which has been hit with problems over water shortage, degradation of the environment and extinction of some fish species. The prime minister will then proceed to meet the people and local leaders of the lower Central provinces and see an exhibition at a meeting hall near Bung Boraphet. He will preside over a ceremony to hand over a letter of permission for the people to make use of land in forest reserves and the hand-over of loans to farmers to build silos under a project of the Bank for Agriculture and Agricultural Cooperatives. On June 12, Gen Prayut will preside over the social and economic meeting of the lower Central provinces before chairing the 4th mobile cabinet meeting at the Phra Bang auditorium of the Nakhon Sawan Rajabhat University. The prime minister and cabinet members will visit a number of development projects in the afternoon before returning to Bangkok. A businesswoman wanted for assisting former assistant abbot of Wat Samphanthawong, Phra Prommethi, to escape via the Laotian border and later to Germany has fled the country. a disciple better known by her nickname “Jum” is now in England. She was reported to have escaped shortly before the immigration officials would be notified of the arrest warrant. The police are still looking for four others who helped the monk to escape. They include Peerawich Srisattha, 28, a close aide to former Phra Prommethi, and three other three Lao people for allegedly abetting Phra Prommethi’s escape out of Thailand. The monk is currently in Frankfurt and is reported to be in the custody of German immigration officials after he reportedly asked for asylum. The government says it will boost selling of Thai products through its official e-commerce channel, Thaitrade.com, to 10 billion baht next year from 5 billion this year. The assurance of doubling of sales through Thailand’s Thaitrade.com, the official business-to-business e-marketplace, was declared by Deputy Prime Minister Somkid Jatusripitak when he delivered a keynote address, titled “Changing Thai Businesses to Online World, underlining the importance of Thaitrade.com. ” yesterday. He said the government was determined to boost sales of Thai products to 10 billion baht in 2019 on the back of the launch of Thaitrade.com. The online channel is aimed to export as many Thai products and to raise transaction value on the national e-commerce platform. Dr Somkid said the website is a new form of the e-marketplace developed to support foreign markets and is the countrys online market. He said the Ministry of Commerce has been assigned to promote the website and launch a new service, called Thaitrade Shop where buyers can shop a variety of quality products from retail operators directly. Meanwhile, Commerce Minister Sonthirat Sonthijirawong said the ministry aimed to increase the number of Thaitrade.com members to 100,000 from 25,000 within three years. The Australian co-founder and former chief editor of Yangon-based Myanmar Times newspaper Ross Dunkley was arrested by police at his apartment in Bahan township early Thursday morning allegedly in possession of a large amount of mehamphitamine tablets and crystal meth, according to a report in The Irrawaddy Online on Thursday. Banhan township police chief, Pol Maj Thein Win, said police found 797 mehamphitamine pills and 303 grams of “ice” in Dunkley’s rented residence in San Yan Twin street. He added that Dunkley was charged under the anti-narcotics law and his allleged offence is punishable by death or unlimited jail term. Dunkley’s arrest caused a stir among local netizens, coming as anti-narcotics police hunt suspects linked to a record drug bust in Malaysia’s Port Kelang in May and a day after they arrested one of the chief suspects, Haj Yassin, aka Maung Maung, in Mandalay division. But Maj Thein Win denied there was any connection between the two cases, saying that Dunkley is a drug user rather than a drug dealer. Dunkley established the Myanmar Times in 2000 in partnership with Sonny Swe, son of a notorious senior Myanmar military intelligence officer, Brig-Gen Thein Swe with the permission of then spy chief Khin Nyunt. However, the entire military intelligence was disbanded by junta leader Senior-General Than Shwe in 2004 with Khin Nyunt and several senior intelligence officers being imprisoned. Dunkley was jailed about one month in 2011 for assaulting and drugging a woman he met at a nightclub. Myanmar Times is currently owned by Pepsi U Thein Tun and publishes both Burmese and English newspapers. National police chief Pol Gen Chakthip Chaijinda has ordered the Immigration Bureau to set up a committee to investigate two immigration officers based at Nakhon Phanom-Kammouen border checkpoint for allowing Phra Prommethi to leave the country for Laos on the night of May 24. A well-informed police source said that the former assistant abbot of Wat Samphanthawong, Phra Prommethi, travelling in a van with a driver and his helpers, passed through the border checkpoint legally with the use of a passport at about 9.30 pm on the night of May 24. The two immigration officers – one inspector and one deputy inspector – who allowed the senior monk to go through the checkpoint face charge of dereliction of duty. Earlier, the Nakhon Phanom provincial court issued warrants for the arrest of two Thai and three Lao people for allegedly abetting Phra Prommethi’s escape out of Thailand. The monk is currently in Frankfurt in the custody of German immigration officials as he reportedly asked for asylum. A 17-year-old boy was arrested and a large haul of drugs, including 8.67 million methamphetamine pills, with a street value of over 100 million baht, seized in a police raid on an apartment room in Lat Phrao area on Wednesday. The drug seizure was revealed by Pol Gen Chalermkiat Srivorakhan, a deputy police chief, and other high-ranking police officers in a press conference today. 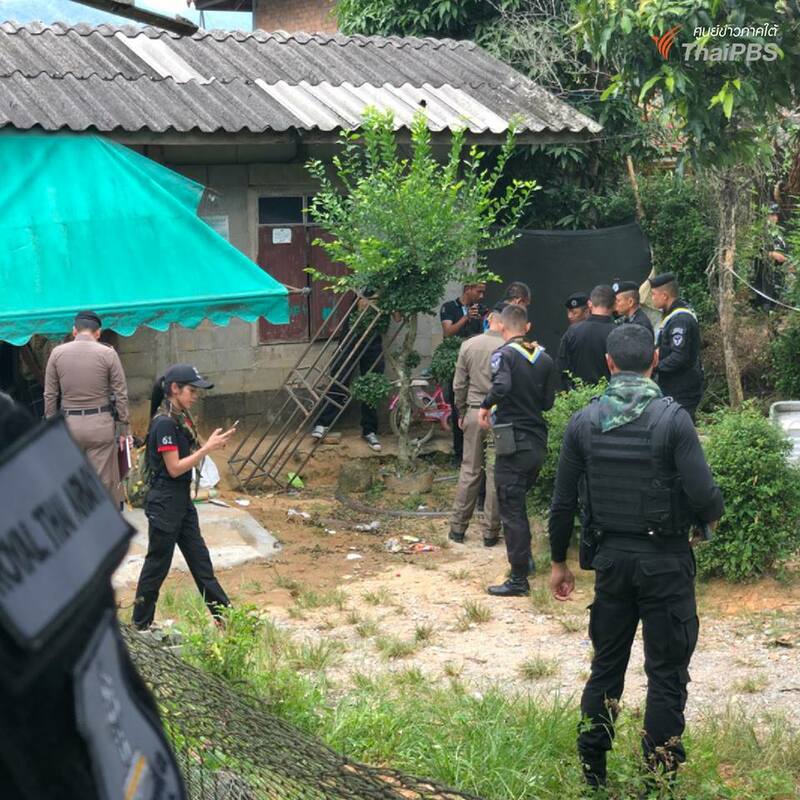 Pol Maj Gen Ruchakorn Jornjewut, deputy commissioner of the Metropolitian Police, said the raid came after a lengthy investigation in to the delivery of drugs from the North to be stored in Lat Pla Khao area. At about 10pm on Wednesday, police arrested the boy, whose name is withheld, while he was walking down from the apartment on Lat Pla Khao road in Lat Phrao district, holding a plastic bag. Found in the bag were 4,000 methamphetamine pills and 3 kilogrammes of ice or crystal methamphetamine. The boy said he took the drugs from an apartment room. He admitted to have sold drugs in areas under the jurisdiction of the 3rd and 4th Metropolitan Police Divisions for two months. He held no previous drug records. In a search of the apartment room, the police found 8.67 million methamphetamine pills, 37 kilogrammes of ice or crystal methamphetamine, 2,822 ecstacy tables, 38kg of ketamine flakes and 569 bottle of liquid ketamine. Police were looking for other suspects for legal action. Two more celebrities turned themselves in to the police to give testimonies over their roles in product reviews for Magic Skin cosmetics and food supplements. 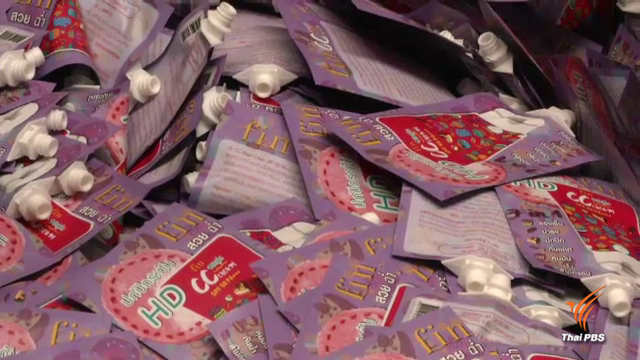 The two actors, Phutthichai Kasetsin or DJ Put, and Kan Kantathavorn told deputy national police chief Pol Gen Weerachai Songmetta and police investigators that they were contacted to review the products and personally, they believed the products were reliable because they saw Food and Drug Administration registration numbers on the labels. Both claimed that many celebrities had also reviewed the products and the advertisements of the products were widely seen on the internet and billboards. After testing the products they found no side effects, so they thought the products were safe and met the standard. But they said they later heard on the news media that the food supplements and skin care products under the Magic Skin were substandard and were illegal. Pol Gen Weerachai said the police will summon 22 other celebrities and net idols to give information about their product review for the Magic Skin brand from June 14-16. Among them are actor Patchara Peach Chirathivat, actress Warattaya Jui Nilkuha, singer Tom Room 39, singer Baitoey, and Chalita Suansane, Miss Universe Thailand 2016. He said this group will be the last group to be summoned in the case. He said so far, 59 celebrities were summoned by the police and 27 persons have already met the police to testify. The police have not yet pressed any charges against them as they are gathering evidence to wrap up the case, but would do later after all investigation is finished, he added. Former Malaysian prime minister and finance minister Najib Razak will be asked to explain how he could approve dubious contracts of two pipeline projects worth RM9.4 billion (about 75 billion baht) that jeopardise the interest of the Malaysian people and the government, according to The Straits Times of Malaysia. Malaysia’s Finance Ministry has discovered that nearly 90 percent of the RM9.4 billion worth of the contracts were paid out but only 13 percent of the construction work has been completed. The projects – one multi-product petroleum pipeline running from Melaka and Negeri Sembilan to Kedah, and a gas pipeline from Kimanis to Sandakan and Tawau, all in Sabah – were handled by Suria Energy Resources (SSER), a wholly owned subsidiary of the Finance Ministry. The projects were awarded to China Petroleum Pipeline Bureau in November 2016. They were signed by then Treasurer-General Irwan Serigar Abdullah who was also chairman of SSER. Finance Minister Lim Guan Eng said in a statement issued on Tuesday that he had instructed his officials to file a report with the Malaysian Anti-Corruption Commission. He said he is calling on former treasury secretar-general Tan Sri Irwan Serigar Abdullah and Mr Najib to explain the deal. Work on the projects began in April 2017. By the end of March this year, work on MPP was only 14.5 percent complete but RM 4.7 billion had been paid to contractor CPPB. The other project, TSGP, was 11.4 precent complete, but RM3.54 billion were paid out. “We have discovered that the payment schedules for the contracts are based almost entirely on timeline milestones, and not on progressive work completion milestones. Worse, based on the agreements signed, 85 percent of the project value would be paid by March 1, 2018,” said Mr Lim. He further noted that the payments did not cover another RM1 billion worth of agreements – two for consultancy services of the projects worth RM312 million and RM213 million and a maintenance contract wirth RM476 million – also awarded to Chinese companies. Responding to the allegations in Facebook post, Najib said he was confident that all necessary process procedures and laws have been complied with. Nakhon Phanom Provincial Court today issued warrant for the arrest of five persons who were responsible for aiding the former assistant abbot of Wat Samphanthawong, Phra Prommethi to escape across the border to Laos. The five persons are two Thais and three Laotians. One of the two Thais is a female disciple of Phra Prommethi and a local business woman. Firefighters tackle a blaze at the Mandarin Oriental hotel in central London on June 6, 2018. A fire broke out at London’s with dozens of firefighters deployed to tackle the blaze that pumped smoke high into the air over the British capital. The Office of Student Loans Fund is considering suing 120,000 borrowers who have defaulted their loan repayments averaging 100,000 baht each this year, said Mr Chainarong Katchapanan, the loan manager. He disclosed that 3.5 million borrowers of student loans are due this year to service their loan repayments with total debts amounting to400 billion baht. In the meantime, he said the office would take legal actions against 120,000 borrowers who defaulted their repayments of debts totaling 12 billion baht, averaging 100,000 baht each. In the past decade, the Office of Student Loans Fund has taken legal actions against 1.2 million borrowers who owe the fund to the tune of 48 billion baht. The fund has, so far, extended loans amounting to 570 billion baht to 5.4 milllion borrowers. Of these, 800,000 cases have been closed, including 50,000 cases of borrowers having died or becoming disabled. Of the remaining 4 million borrowers, more than two million of them have defaulted their repayments. However, he said the fund planned to extend new loans estimated at 30 billion baht to some 700,000 students this year. As far as loan repayment is concerned, he said that beginning July this year, officials of the Comptroller Department who used to be loan borrowers would become the first group of officials who would have their salaries deducted to service their student loans. In case of corporate employees who used to be loan borrowers, salary deductions to service loans will start at the end of this year with employees of big corporation such as CP, Krung Thai Bank and state enterprises. Prime Minister Prayut Chan-o-cha said he planned to meet with political parties some time this month after the Constitutional Court on Monday ruled that the amendments of Sections 140 and 141 of the Political Party Act by Order No.53/2560 issued on Dec 22 last year by Prime Minister Prayut Chano-cha in his capacity as chairman of the National Council for Peace and Order (NCPO) did not violate the 2017 constitution. “I will not raise any conditions. Whoever wants to come, come. I will not ask any party to join. As for parties which do not want to come, the people will decide for themselves why. “As for a proposal by some parties for the meeting to be televised live, I would take it for consideration. I want to look into honesty of individual parties,” Gen Prayut said. Concerning the call for the NCPO to lift the ban on political activities, he said the proposal would be taken for consideration on a case-by-case basis during the initial stage. The NCPO would have to consider the ban on which activities should be lifted. “If the ban on all acvities of political parties is totally lifted at the same time, who will guarantee that there will not be any problems as happened in the past protests,” Gen Prayut asked. He said that in the past political campaigns were plagued with mud-slingings instead of concentrating on what would be done under the policies of individual parties, adding that he did not want to see this happen. The prime minister said he would like politicians and political parties to guarantee that they would strictly abide by the laws in conducting political campaigns and declaring party policies. The country should be ruled by law and order, he added. Gen Prayut said if the people want a government with good governance, they have to be prepared for an election. “They must help prevent a recurrence of political activities that can lead to more conflicts,” he added. He said he would forward organic bills on the election of MPs and the acquisition of senators to His Majesty the King for royal approval within the timeframe stated in the constitution. However, he has not yet received the two bills, which are being handled by Deputy Prime Minister Wissanu Kreangam. Many elephants have been brought to receive medial treatment at the elephant hospital in Krabi province after they fell sick, possibly from eating mud and fruits and vegetables contaminated with toxic chemicals. Benjatham Thaitham, a veterinarian at the Krabi elephant hospital, said that after the arrival of the rainy season many elephants have been brought by their mahouts for treatment. About 10 pachyderms were brought to the hospital in May alone, she said. The elephants are for hauling logs and used in tourism promotion activities. Most of them suffer from flatulence and infections in the respiratory system. Ms Banjatham said it was initially believed that the animals fell sick because of the food they had eaten. They included rotten pineapple and fruits contaminated with toxic chemicals. Since elephants like to eat mud which comes with the rain and, to them, has a good smell, the mud which is contaminated with diseases and chemicals may have caused them to have a problem with the excretory system. They may die if they are left without treatment for a long time, she said. In an effort to prevent repeated flooding in Bangkok, the Bangkok Metropolitan Administration (BMA) yesterday held meeting with authorities from five surrounding provinces to map out water management plan and preventive measures as heavy rains have been forecast during the forthcoming rainy season. The surrounding provinces include Nonthaburi, Nakhon Pathom, Chachoengsao, Pathum Thani and Samut Prakan. Highlight of the issues discussed was the flooding on Ngamwongwan Road in Chinnakhet 2 area where residents have repeatedly suffered flooding when the rainy season arrives. This area is the connecting point between Bangkok and Nonthaburi province and it is one of the four connecting points that are under special attention when there is heavy rain. The four connecting points that are the flood risk locations are Sukhumvit Road at Bearing BTS skytrain station at Soi LaSalle; Pahonyothin Road, between Sear Rangsit Department Store to Lam Luk Ka intersection; Chaeng Wattana Road, from Khlong Prapa canal to the Government Complex; and Ngamwongwan Road, from Soi Chinnakhet 2 to Khlong Prapa canal. The meeting discussed plan to integrate action to fight against flooding. After over three hours of discussion, Bangkok governor Pol Gen Aswin Kwanmuang said the meeting concluded that the agencies concerned will urgently prepare the readiness by cleaning the drainage system at the small roads which should be finished by July. The operation should be launched to open the water flowing by getting rid of the weed along waterways and dredge the canals. The operation should be finished this month. In addition rapid response units at 108 locations will be set up and flood prevention and response centre will be open to distribute flood information for 24 hours. BMA is confident that the Bangkok residents will suffer less flood impact when compare with the previous years, he said. The deputy governor of Nonthaburi province admitted that Ngamwongwan area is the most worrisome as the area is inundated when there is heavy rain. He said It normally takes half day to drain the floodwater but at present the authorities take only two hours to drain the floodwater. One defense volunteer was injured on Wednesday when a roadside bomb went off as security officials were on a patrol to give protection to a team of explosive ordnance disposal inspecting a suspicious object near the scene. The explosion happened in front of Ban Sakor school in Tambon Tasab of Yala Muang district. A team of defence volunteers was on a routine patrol to give protection to teachers when a suspicious object was sighted. As an EOD team arrived to inspect the object, a hidden bomb planted by the roadside was then detonated, injuring one volunteer. Crime Suppression Division (CSD) police say they will file human trafficking charge against the former assistant abbot of Wat Saket, Phra Wisutthisasanavithet or known as Chaokhun Ping, if a child he had sexual relation is underage. Chaokhun Ping, also former secretary of Phra Prommasith, former abbot of Wat Saket, has earlier been defrocked after admitting to have in possession pornographic materials showing he had sexual relationship with a male teenager. Pol Maj GenKornchai Klaiklueng, the commander of the Anti-trafficking in Persons Division, stated that they were coordinating with the Crime Suppression Division to track down the young man in the pictures found in Chaokhun Ping’s chambers. He said that he was confident that this would not take too long and if it was found that the young man was under 18 years of age, then the defrocked monk will have to answer for human trafficking charges. He said the CSD police were inspecting all monks chambers at Wat Saket to determine where Chaokhun Ping or any other monks had got the pornographic material from so that an official action can be taken to address the improper conduct and sexual deviance of Buddhist monks there. The White House has announced that the historic summit between US President Donald Trump and North Korean leader Kim Jong Un, scheduled for June 12, will take place at the Capella Hotel on Singapore’s resort island of Sentosa. White House press secretary Sarah Huckabee Sanders confirmed the summit is scheduled to begin at 9 am (Singapore time). It will be the first meeting between a North Korean leader and a sitting US president. “We thank our great Singaporean hosts for their hospitality,” Sanders said in a tweet. The colonial-style Capella is a five-star hotel built in the 1880’s to accommodate British military officers. Fashion designer Kate Spade dead in an apparent suicide at age 55. 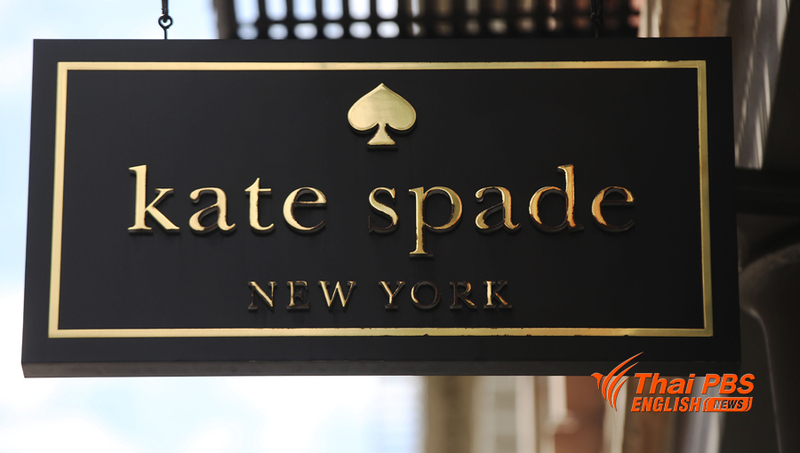 Designer Kate Spade, one of the biggest names in American fashion, was found dead on June 5, 2018, in New York after apparently committing suicide, police said. She was 55. Celebrity website TMZ said the designer especially known for her sleek handbags and former editor of Mademoiselle magazine hanged herself in her Park Avenue apartment. Led by the Ministry of Natural Resources and Environment, 20 ministries and the private sector today launched a campaign to reduce the use of plastic bags to mark the World Environment Day, which falls on June 5 of every year. Gen Surasak Karnjanarat, the natural resources and environment minister, said the campaign will start with concerted efforts to reduce the use of plastic bags with straps and Styrofoam materials in their offices, starting June 5. Their intention is to create an environmental awareness, he said. Gen Surasak said during the past 10 years, Thailand has produced about 2 million tonnes of plastic garbage every year. 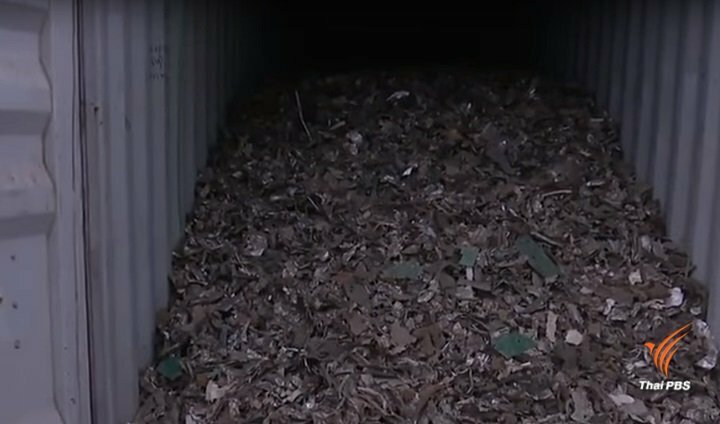 Of this, only 0.5 million tonnes are reused. Most of the plastic bags are contaminated or infected. The plastic trash not only affects health and the environment but also the country’s economy as a whole, he said. Pictures of rafts of plastic garbage in the ocean and its effects on marine life including sea turtles, whales, dolphins and rare sea animals clearly show that the environment problem caused by plastic waste has become more serious, Gen Surasak said. “In 2016 alone, the country had 27 million tonnes of garbage, of them 3.2 million was plastic. The figures coincide with information of the United Nations Environmental Programme which says that as many as 500 billion plastic bags are used worldwide each year. One half of the plastic products are for one-time use – including spoons, forks and cups. Each year more than 13 million tonnes of plastic garbage were dumped into the sea. Thailand is ranked 6th among countries in the world with the highest amounts of plastic garbage,” the minister said. Gen Surasak said that in the cabinet meeting of April 17 this year, Prime Minister Gen Prayut Chan-o-cha ordered the Natural Resources Ministry, the Interior Ministry and other agencies concerned to start a joint campaign, with cooperation from the private sector, for the reduction of the use of plastic materials. Ratchada Suriyakul Na Ayutthaya, director of the Department of Environmental Quality, said there will be an activity entitled “Run For Nature 2018” at the Ayutthaya Historical Park in Ayutthaya province to promote various kinds of environment-friendly runs, aimed at reducing plastic thrash, particularly plastic cups and bottles. Proceeds from the event will go to the Ayutthaya Hospital and the Forest Protection Foundation. Interior Minister Anupong Paojinda said today local elections, including the one for Bangkok, are likely to be held before the end of this year as the Council of State, the agency which advises state agencies on legal issues, is in the process of wrapping up amendments of six related laws. All local elections in the country have been suspended since the National Council for Peace and Order came to power four years ago. The six laws that Gen Anupong referred to concern elections of the Bangkok Metropolican Administration (BMA), Pattaya City, provincial administration organisations (PAOs) and municipalities of various levels. Once approved by the Council of State, the proposed amendments will be forwarded for a joint meeting of the National Councill for Peace and Order, the government, the Election Commission and other agencies concerned, said Gen Anupong. Asked whether the local elections should be held before or after the general election, which has been tentatively scheduled for February next year, Gen Anupong said once the related laws have been amended the local elections should be held in 45 days. He said the local elections are likely to be held before the end of this year, provided that the laws are well in place but added that he agreed with a suggestion that there should be ample interval between the local elections and the general election. Foreign Minister Don Pramudwinai clearly declared this morning that he will not resign over his wife’s share-holding in a business company until there is a ruling by the Constitutional Court. The Election Commission recently ruled with a majority vote that Mr Don might not be qualified to hold a ministerial post and said it would ask the Constitutional Court for a final decision. The ruling prompted critics to call for Mr Don to resign or for Prime Minister Prayut Chan-o-cha to suspend him from duty, pending a decision by the Constitutional Court. Mr Don was all smiles when he arrived at Government House this morning to attend the weekly Cabinet meeting. Asked whether he would insist in continuing to perform his duty, Mr Don replied that “the answer is on my face,” adding that despite the controversy he was feeling any pressure. He said if he had thought about resigning he would not have come for the Cabinet meeting. Mr Don said he had not discussed the matter with Gen Prayut. He said his wife’s shares were inherited from her father 37 years ago. They are shares held within the family and not listed on the Stock Exchange of Thailand, he said. Deputy Prime Minister Wissanu Krea-ngam on Tuesday repeated his stand that it was not necessary for Mr Don to resign and that he should wait for the Constitutional Court’s ruling. He said he did not know when the ruling would come out as the Election Commission has not yet forwarded a request to the court. Foreign Minister Don Paramatvinai has come out to defended his wife’s unreported share-holding exceeding 5 percent which was cited as a reason for the Election Commission to rule that he might not be qualified to assume his ministerial post. He explained that the shares of his wife, Mrs Nareerat, were inherited from her father 37 years ago and they were family shares owned by 6-7 siblings of his wife. He said all the shares were not traded in the stock market and his wife was not involved in the management of the company. He also insisted that his wife’s shares were included in the list of assets and liabilities which was submitted to the National Anti-Corruption Commission when he assumed the foreign affairs portfolio. The foreign minister said he had already reported to Prime Minister Prayut Chan-o-cha about his wife’s share holding on June 1. The Election Commission’s investigation into Mr Don’s wife’s share holding was in response to a complaint lodged in May last year by Pheu Thai legal advisor Ruangkrai Leekitwattana who also demanded the EC to probe the share-holdings of eight other ministers. After the EC’s resolution, Deputy Prime Minister Wisanu Krua-ngarm said there was no need for Mr Don to quit now and suggested the latter to carry on with his work as usual. Dr Wisanu noted that the case was not over yet and it has to be decided by the Constitutional Court. But former Pheu Thai MPs and political activist Srisuwan Janya have put pressure on Mr Don to resign. According to Isra news agency, Mrs Nareerat held 12 percent shares of registered capital in Panawong Company and another 17.5 percent in Panawong Realty Company. In October last year, Mrs Nareerat reduced her shareholding to just 4 percent by transferring the rest of the shares to her son, Mr Puen, but this was not reported to the NACC.